and I paint the dream "
Frank Spenlove-Spenlove was a hugely talented, prolific & dedicated British artist and a great mentor to hundreds of young artists learning to paint. 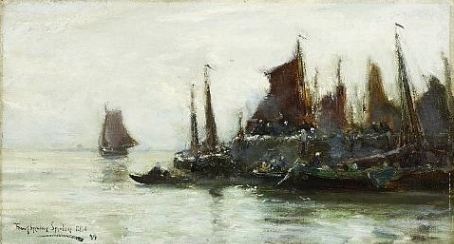 He worked in both oils and watercolour. 'Frank' John Francis Spenlove, was born in the Scottish town of Bridge of Allan, Sterlingshire, on the 24th February 1864 and died of pneumonia in Chelsea in the May of 1933. He is buried in St. Mary's Church yard, Purley on Thames, England. The son of Captain John Francis Spenlove-Spenlove, late of the Fife Artillery and originally from Abingdon, Berkshire. His mother was Mary Sparrow. Frank had two sisters, Susan Mary Anne born in 1861 in Merton, Surrey and Jane, born about 1862. 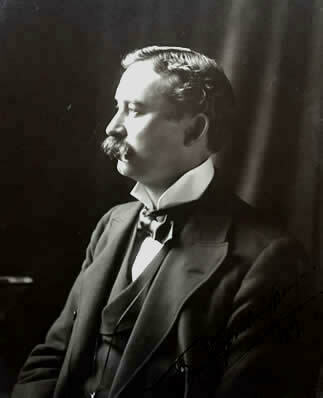 Frank was also the Great-Grandson of Sir Marmaduke Constable, a High Court Judge. In 1891, Frank Spenlove married Clara Florence Bostwick-Strong, a Canadian girl who came from a wealthy family, originally from London, Ontario. 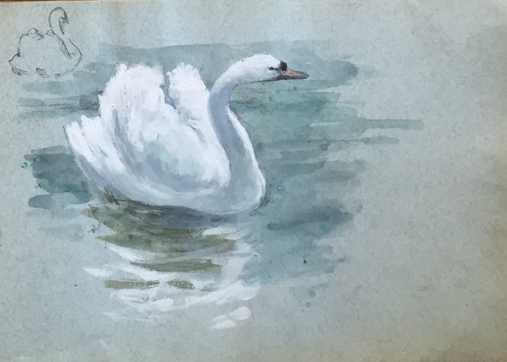 Clara had suffered deafness since contracting an infection in childhood and she and Frank had three children; Adelaide, Theodora and John Francis.He like his father, became an accomplished artist, choosing to live and work in Cornwall. When only a boy, Frank Spenlove and his two young sisters suddenly faced the loss of their father and Frank became the man of the household. Now with new and difficult challenges to face lying ahead. From a very early age, Frank Spenlove - Spenlove, not only was expected, but wanted to follow in his father’s footsteps and become an army officer, fully intending to become a soldier. But for Frank, this was not meant to be. The sudden death of his father was about to force Frank into other more responsible shoes. Financially, things at home were in an unhealthy state following the death of Captain John Francis. So at the age of seventeen Frank became the breadwinner and entered the commercial world as a mercantile clerk. After only two years he was earning a remarkably good living for such a young man. And And Frank had developed serious and adult aspirations and was facing excellent prospects of promotion. But things were about to change for him again! Life seemingly has a strange way of altering matters forever and when least expected and it was about to turn Frank Spenlove’s world upside down. 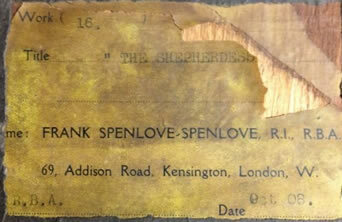 In his youth, Frank Spenlove was a privileged lad, attending private school at St. Paul's in Hammersmith. An independent and select London boys school. It was here that he became an excellent scholar, athlete and a promising academic. Particularly so as a mathematician. This was a subject that he not only enjoyed, but excelled in. 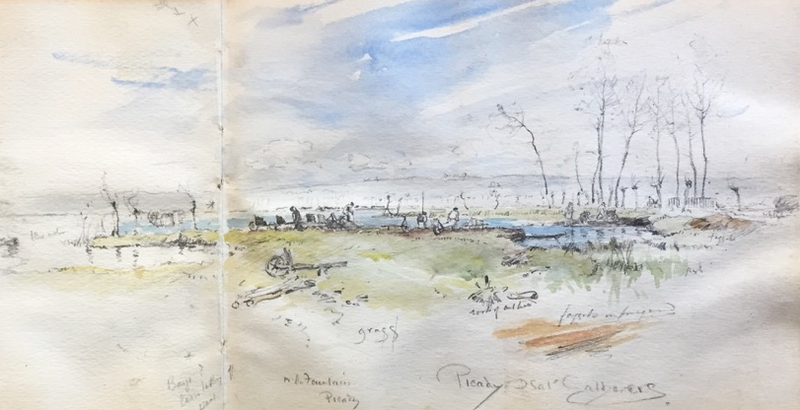 Frank Spenlove also had a great love for art and of drawing, which clearly came from his mother and certainly not from his father's side of the family. 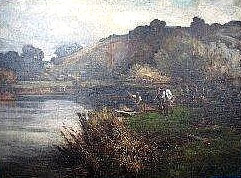 Frank’s biggest claim to fame 'so he said' and one that he maintained all his life, was that he was distantly related to the British artist John Constable, primarily as his great grandfather was a namesake. But whether or not that was a sign of the practical joker in Frank Spenlove the man we will probably never know. And something of a joker he indeed was. His grandson recalls how one night at dinner, Frank had rigged up a small balloon under his plate. It was a contraption designed with a length of tube and finished with a rubber hand pump leading back to Frank underneath the table. The astonishment of the 'self rising' plate still remains in his memory. 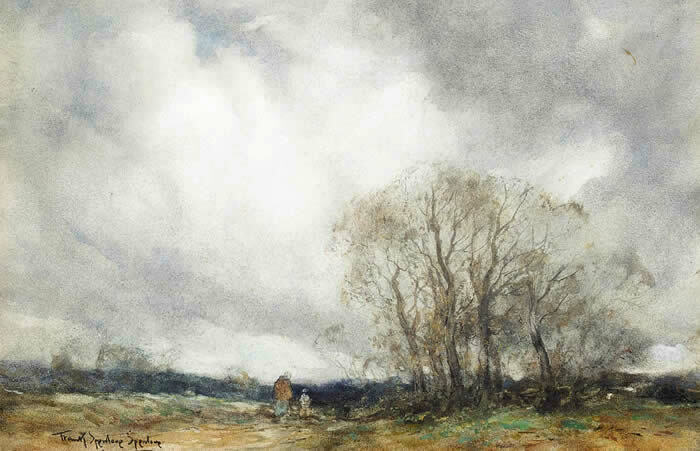 Frank Spenlove is most noted as an artist for his fine atmospheric landscapes, worked in both oil paint and watercolour. 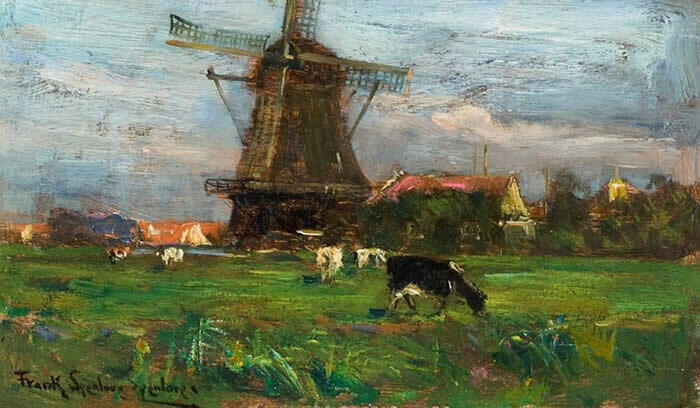 They were often of subjects that he painted in Suffolk and particularly in Holland, which reflected in his style. 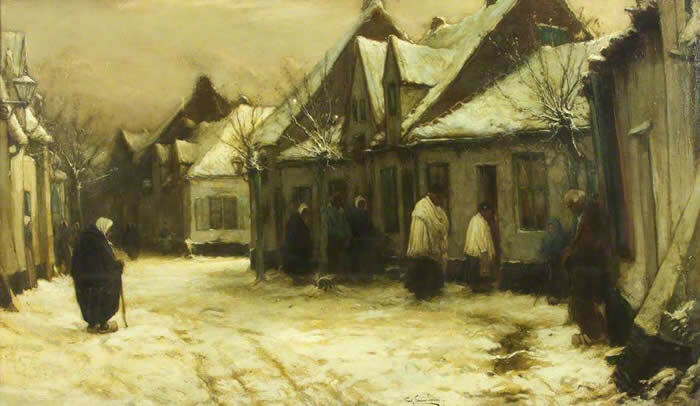 He also worked extensively in Belgium and in Kent. 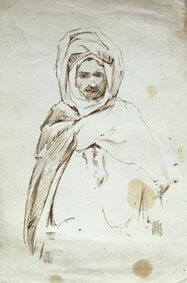 Though he travelled widely, often on his own, working in Italy, Spain and Tunisia in North Africa. 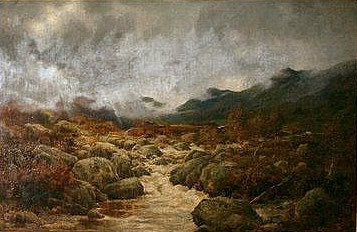 he also visited Switzerland, Picardy and Brittany in France over a long and successful career as an artist. 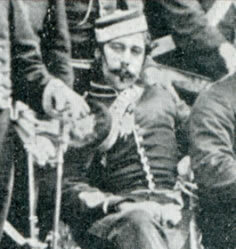 Captain John Francis Spenlove-Spenlove Snr. 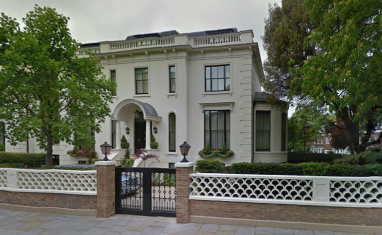 1881 When he was 17, he is listed as a mercantile clerk and living at, 50 Oakley Crescent, Chelsea, Middlesex. 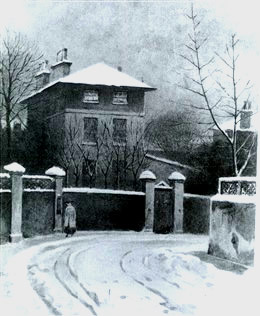 These houses are described in the History of Chelsea as small, Italianate houses in brick and stucco on the west side of Manor Street. Now long since been demolished and replaced. 1891: The Hermitage, Croyden Road, Beckenham. 1895; Kent House, Lansdowne Road, Notting Hill. London. 1896: The Studio; 2, Stafford Place, Buckingham Gate, Westminster, London. Less than five minutes walk to the Yellow Doors Studio in Victoria, which was set up in the same year. 1900: Studio, 28, Conduit Street. London. 1915: Studio, 116 Victoria Street. London. And finally to; 12A, Shelly Court, Tite Street, Chelsea. 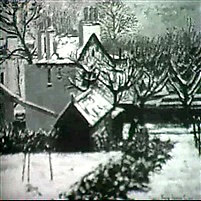 Frank Spenlove had always followed his hobby as an artist and he asked for and eventually obtained a room which he made into his first studio. It was a place where; “free from others eyes, I could work in a manner dear to my artistic soul”, he wrote. 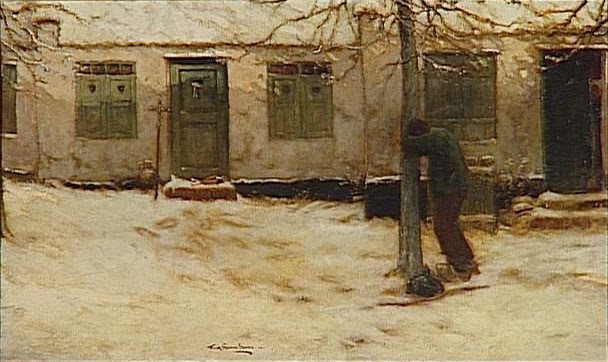 It was here in his very first studio that he painted a portrait of his father, much as he remembered him in his military uniform. 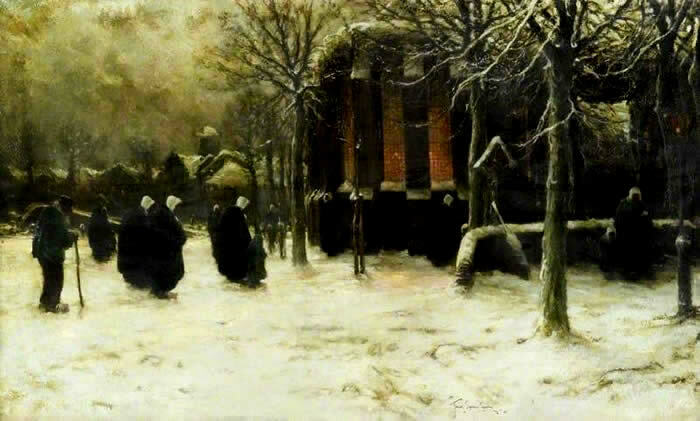 Sadly now this is a painting which is long lost. "The landscape painter must aim at the interpretation of Nature, rather than the representation of Nature." Now fate makes a twist in Frank Spenlove's career. 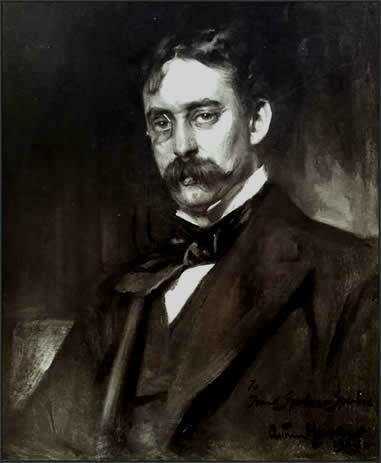 One day whilst visiting Frank's mother, a Mrs. Jane Ellen Panton, who was a writer of popular domestic and advise books and one of the daughters of the eminent British artist William Powell Frith R.A., happened to see the portrait that Frank had painted of his father and asked for the loan of it to show the great artist. Somewhat impressed and probably mostly flattered, Frank agreed. And William Powell Frith wasn't about to let it. 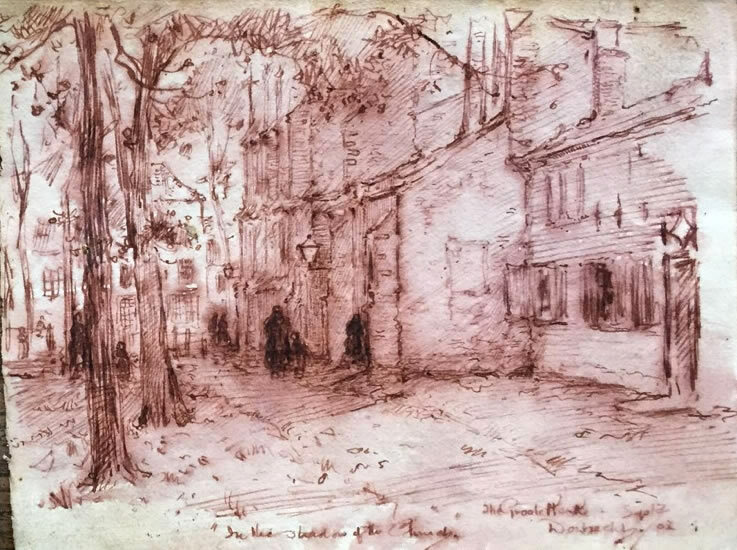 An invitation from Frith followed, beckoning the young Frank Spenlove-Spenlove to his London home, where we are told, the great artist was; "very kind and complimentary". The praise Frank received about the standard of his art was indeed genuine praise. And coming from a great and well admired artist, Frith urged the young Frank Spenlove to take a new course in life's direction and take himself on a drastic career change. Frank tried admirably to explain to the man his difficult position and they discussed at length the families’ current circumstances. He told him that he was doing well in business and now that he had others depending upon him, he could not possibly alter course. Certainly he could not afford a long an expensive period of training. Frank Spenlove returned home from his meeting with William Powell Frith and told his mother about the conversation he had with the artist. Not unexpectedly anxious, she made it very plain to Frank that she didn’t want him to make a grave mistake by throwing away his certainty in business for the dreadful uncertainty of art. Though it was to be a difficult financial road that lay ahead of him, Frith’s praise had sparked a new flame and ambition in Frank Spenlove's heart and an artist he became. The first step on that long road for Frank was to be a spell at the St. John’s Wood School of Art in London, founded seven years earlier. Though at the time it was more an artist's studio, nurturing fresh talent about to enter the Royal Academy Schools than it was the fully fledged art school it was to become. However, it was a fine grounding for the ambitious young artist. Though Frank rightfully used the designatory letters 'R.C.A.' after his name, this was applied for his affiliation to the Royal Cambrian Academy and not the Royal College of Art, as has been alluded to by some commentators and would have been expected of him having trained at St. John's Wood. 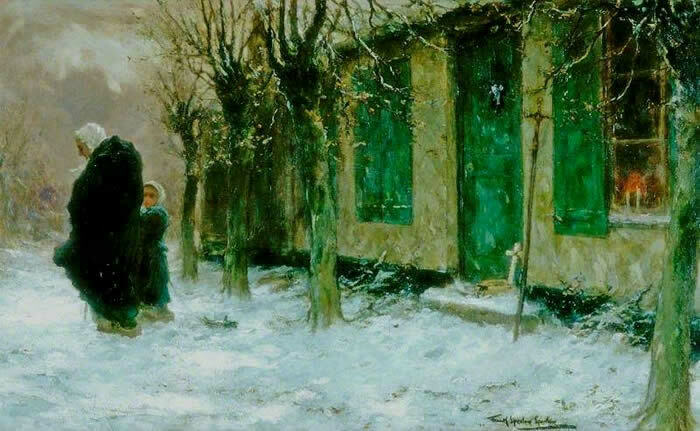 Here, practising under the Peruvian born artist, Abelardo Alvarez Calderon (1847- 1911) later to become a RA. himself, Frank studied anatomy, composition and painting techniques. And to pay for his private tuition of five shillings, Frank’s evenings were taken up with coaching students who needed practical help with mathematics. He would do whatever part time work he could find to support his mother and sisters. From Calderon's London studio, as I have already said, the next stop would normally be attendance at the Royal Academy school and in his own art school's prospectus and advertising, there are implications that he may have had a Royal College of Art affiliation. But he apparently didn’t study there or ever become an Associate member [ARCA] as had been suggested by other commentators. 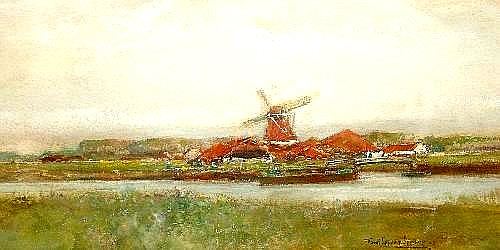 Frank would now admirably take himself off, first to Holland in order to study the methods of the Netherlands painters whom he had always admired. 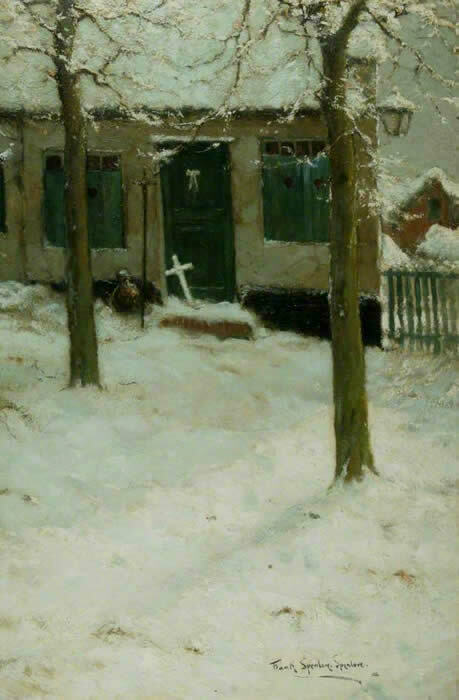 Then on to Belgium's Royal Academy of Fine Arts in Antwerp and finally to Paris, where we draw a blank at which studio he attended and identify artist who tutored him. 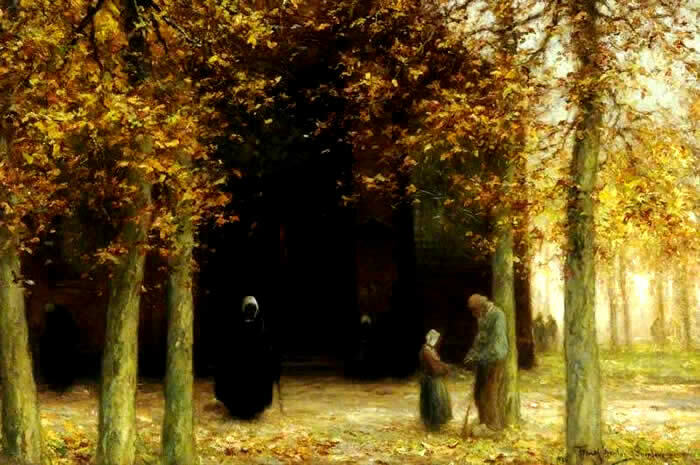 In 1887 Frank was rewarded for his efforts, when the Royal Academy exhibited two of his paintings which came about as a result of this tour. and ~ In the Stack #742. Both pictures soon found buyers, which was a great relief to Frank as he was getting desperately low on finances. The following year he was successful again at the Royal Academy. 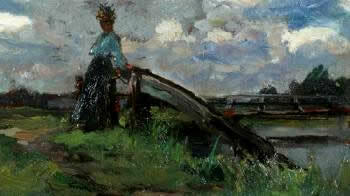 This time with a painting called; the Farmers Daughter #849 ~1888. Silver Morn #225 - "In the Evening, it shall be light" # 493 - In the low country - early morning #804 - L'etude #841 - Eventide after rain #921 - A Grey Morning #963 and finally; Wane of the year #1242. Varnishing day’ at the RA was a special event in the Royal Academy calendar. Traditionally one set aside, just before the official opening of the Royal Academy Summer Exhibition. It was a time when artists could 'retouch' or 'varnish' their paintings, with some even completing unfinished works of art or attending to paintings they felt needed additional features. But in reality ‘Varnishing day’ had become a celebrity preview day. A time when journalists and critics could meet and discuss the works on display and well in advance of the official opening to the public. 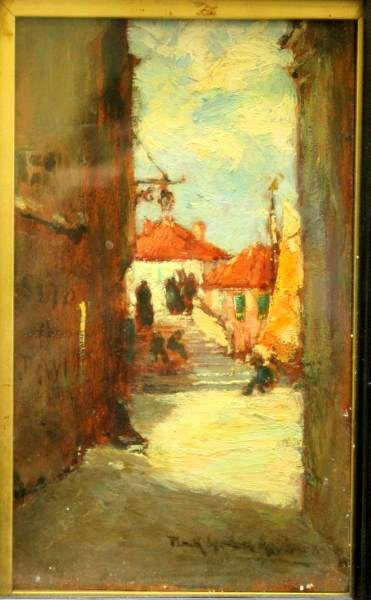 Frank introduced himself to the man as the painter and received a fine compliment. “That is a good picture, a very good picture indeed Sir. Obviously impressed, he asked Frank if he had any more works on display. With six more hanging at the exhibition for him to discuss, it was a fortunate meeting. 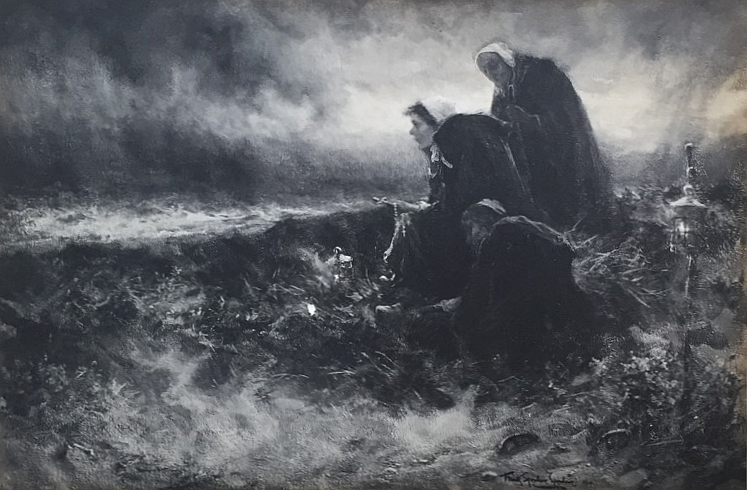 Coming from Sir John Everet Millais, the creator of ‘Bubbles’and the masterpiece ‘Ophelia’, that was a resounding compliment that had been paid to Frank Spenlove and a fine reward for all his hard work and what began with all the uncertainty of a professional career in the world of art. 1889 and Frank's 'Matter of Do or Die'. “The year 1889 was a memorable one for me. 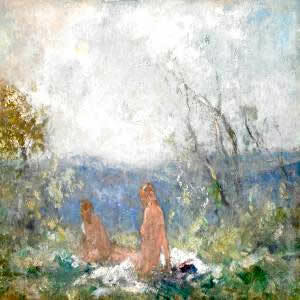 In the first place I had no fewer than seven works in the Royal Academy that year, and in the second place, in connection with one of those pictures, called “At Eventide, it shall be light” I had the following remarkable experience. – at least I think it may justifiably be called remarkable. On the Sunday night before “Sending in day”, I had a dream, a very bad dream. I dreamt that I saw my “Eventide” on the easel as I had left it the day before, but down the centre of it ran a cascade of water which came from nowhere, and in my dream I saw my picture, one on which I had spent so much thought and labour, quickly washed away. The dream was most vivid and I awoke from it feeling very nervous and upset. At breakfast, I told my mother that I was sure something had happened to “Eventide” and leaving my plate untouched, I hurried over to Beckenham - I was then living at Shortlands – and rushed into my studio. 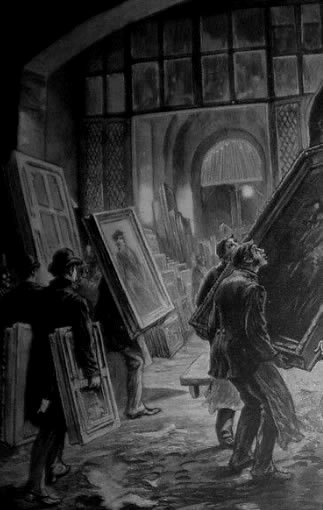 There lay my beloved picture on the floor, with a great, gaping rent where the handle of the easel had transfixed it in its fall – A fall due no doubt to my having left it carelessly placed on the easel. If my dream had in someway prepared me for calamity, it was none the less a terrible blow, and for a few minutes I was quite unmanned. And then I pulled myself together, an the damage being irreparable, I posted off to town, got a new six foot canvas and set to work to re paint my picture. I had but four days to do it in, but succeeded, with just an hour or two to spare. Further, I am sure that the second edition of “Eventide” was much better than the first, for it was a case of do or die. the Yellow Door School of Landscape Painting. 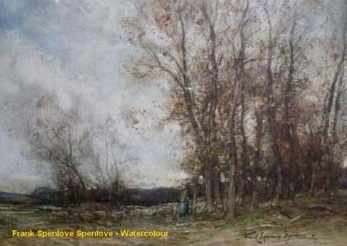 So it was to be in Beckenham in Kent, back in 1896, that Frank established the now famous Spenlove School of Modern Landscape Painting. 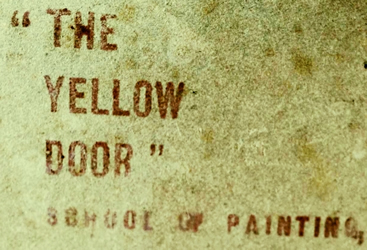 Better known as the 'Yellow Door School of Art'. "The French system of teaching is better than the English because French masters take students up and train them individually." This was a firm policy and method he adopted and followed all his life, running his own art school in much the same, less formal and relaxed way. Thus he allowed his pupils 'great room for individuality' and the additional scope to 'develop their very own style.' Though endowing them with; "superior technical knowledge" and the basis with which to accomplish it. Frank would devote a generous amount of time to each student, suggesting individual improvements and urging them on with great enthusiasm. Teaching them to observe and develop their art. All of his pupils truly admired the man. 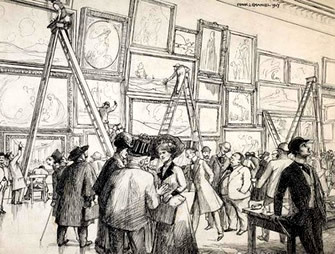 Observers to the art school sessions record how impressed they were with what an extraordinary 'variety' of styles were to be seen amongst his students' work. The Yellow Door Art School was originally located at No. 34, (later No.80) Beckenham High Street, but in November of 1917 it moved to its permanent home 116, Victoria Street, in London. 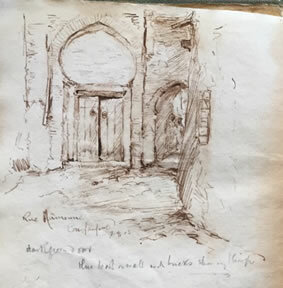 Though the original building in Beckenham was destroyed during the war and the schools future records are equally sadly lost, likely also destroyed during the war years when stored with his paintings and chattels, Frank's legacy lives on. With huge number of his art students becoming successful artists in their own right. As can be attested to by the copious list of numerous artists we do know that trained under him. Though this is only the tip of the iceberg. 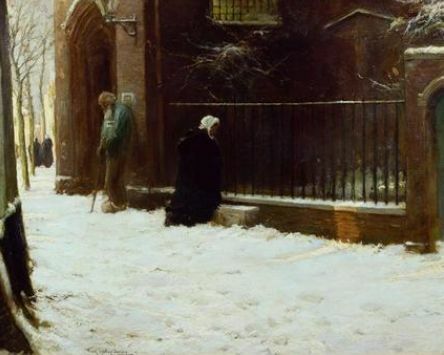 Towards the end of the 19th century, during the period in which the Yellow Door Art School in Beckenham was first established, there was a unique boom in the development of both public and privately run British art schools. 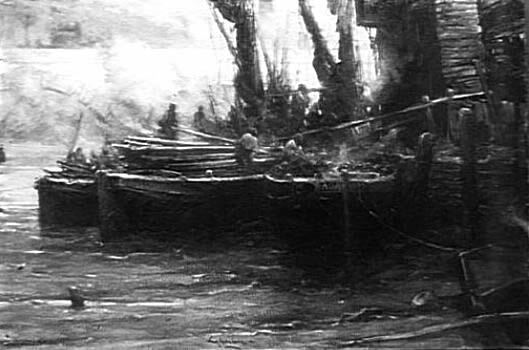 Between the 1850s and 1900 there had been a dramatic, nation-wide mission launched by the government, one which had established hundreds of art schools across Great Britain and Ireland and all in part-sponsored and approved by the government’s own ‘Department of Science and Art’ which was based in South Kensington. The Royal College of Art was the main institution behind the push and at was at the true heart of this scheme. Though the Department of Science and Art itself controlled what was a very complex and comprehensive system of art education in Britain. This included its examinations and inspection, competition and the awarding of certificates and medals of merit to encourage excellence from its students. The town of Beckenham was a good choice for establishing one of these new art schools and the Beckenham School of Art, established in 1901 was first to be officially set up. Beckenham was after all, an affluent London suburb and there was no shortage of earlier private schools vying for the tutoring of students in art. As can be attested to by advertisements appearing in Local Newspapers around the 1880’s. For Edwin Buckman, art tutor to Queen Alexandra, his was a private art school and one that in turn became the studio of Henry Carr RA. After him it became the studio of the painter, Laurence Norris RA, then two other artists took over, one called William Ainsworth Wildman and finally another called Wolfe Kassamov, knowledge of whom little is recorded. The Beckenham School of Music and Art; based at number 10 -11 The Parade, Beckenham. This training school seemingly had unlimited pretensions and an aristocratic, though interchangeable pedigree. Offering an extravagantly colourful, almost pompous style. It boasted a manicured staff of; “fifty professors”and was led by its eminent Director of Studies, the classical composer of music, Mr. Arthur O’Leary. It had an art master called Hugh Bellingham-Smith, who was a medallist of the Slade School of Fine Art at London University and he was later replaced by another art master called Mr. Pyne. Like Frank Spenlove's school, this school sought to teach drawing and painting from “Natural Objects and Life. With a special attention given to the encouragement and development of individual talent”. training employed based upon that encouraged in all First Class Continental Studios. Signor Amando Profile, who Frank spelled as 'Profile'. He was actually the Italian, Peter Armando Profill, the late master at King¹s College, London. The Yellow Door school of art offered practical tuition both in the studio itself, to those in specific attendance to one of the first private art schools to be opened near London and even more uniquely, by offering correspondence courses to those further afield. 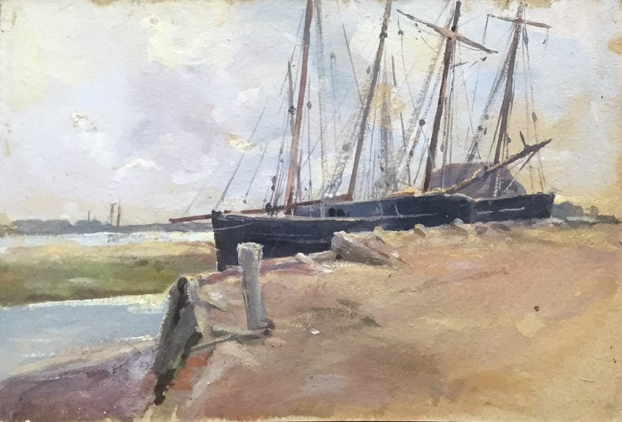 The Spenlove art correspondence courses would open up to the world, real practical training in painting and moreover professional critique and advise from a leading exponent of painting at the time. 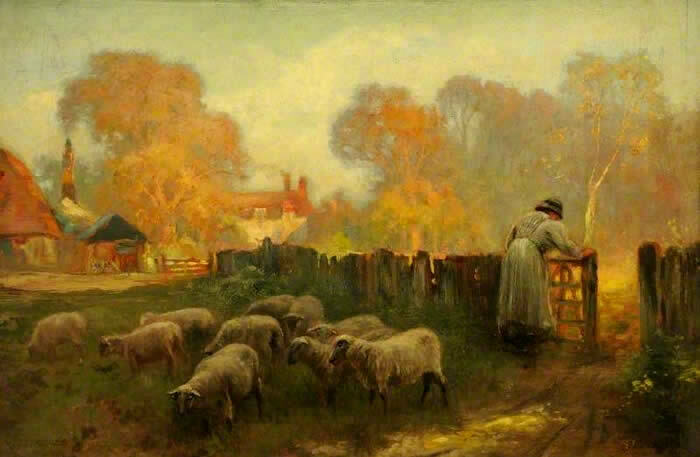 This came from an increasingly famous man and an artist that had exhibited near 100 times the RA and who was represented in some of the most major collections in the Commonwealth including that of the Collection King George V. Frank Spenlove Spenlove. Allegedly no fewer than fourteen thousand students passed through the Spenlove art studio, though this is in no way confirmed and is typical of the flowery and often exaggerated claims made by art schools of the times. All to be taken with a pinch of salt. But Frank certainly nurtured and tutored many, many artists and even more through his successful correspondence courses. What is very clear however, is that his attendee students travelled from all around the Kingdom to be trained under Frank's watchful eye and we are told, from as far afield as; Russia, Japan, France, Spain, Canada, Australia, New Zealand and the United States. All wanting to train at his truly 'international' school of art. 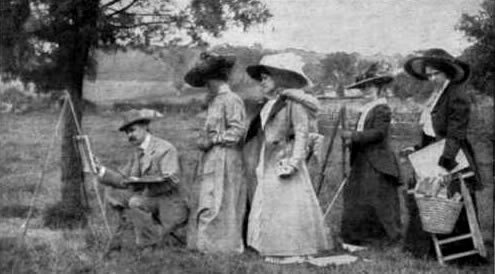 He also offered what was advertised as; 'SPECIAL OUT-DOOR PAINTING CLASSES' En plein air, near London during the Summer which is covered later. Private art schools of the time were prone to puffery, high on labels, titles and rather self assumptive claims, but were often short on content and invariably run with meagre resources in rented rooms. But Frank's was a serious concern and well respected. What they did offer had great associative appeal, by way of drawing and painting 'like a real artist', but without any of the obligations, regulations, examinations and presentations that art students in the official art schools worked to. But it was obvious that Frank wanted his art school to have the best of both worlds and like the new state run art schools, when assessments were made of his students works, or if they were lent to exhibition, they bore the art school's own rubber stamp. * The author is grateful to many of the members of Frank Spenlove-Spenlove's family for the valuable information and images they have supplied. This detail has enabled me to make this information about the artist much more reliable for students of art history and thus, for the enjoyment and appreciation of all. in the catalogued lists below. a former ex student & we believe, his studio assistant. R.C.A., R.B.A. &c., & c.
Only a limited number of Students received. The summer and Miniature Painting. tages to those taking Art up professionally. Mr. S Spenlove’s immediate supervision. at the Studios, on Fridays, 3.30 to 4.30. Also in 1905 when this single honour was repeated when the work “Trop tard – Return of the prodigal” was bought for the Luxembourg. And again in 1906 when “Le dernier voyage” was acquired by the state for the Hotel de ville Paris. The highest honours that can be given to a living artist. It is a remarkable achievement for Frank Spenlove to have taught, encouraged and fostered so many aspiring talents at the Yellow Door School of Art. Many are artists that have been both successful in their careers but equally, influential in their own artistic circles. This is but a handful of people that I have discovered in my limited research, as all records of those attending the art school are lost. There surely are countless others who attended, yet to be added to this list. What is obvious is the number who were deemed good enough to have their works hung at exhibition level. Just look at those RA's. This surely is a measure of the man? Paul PAUL RBA. 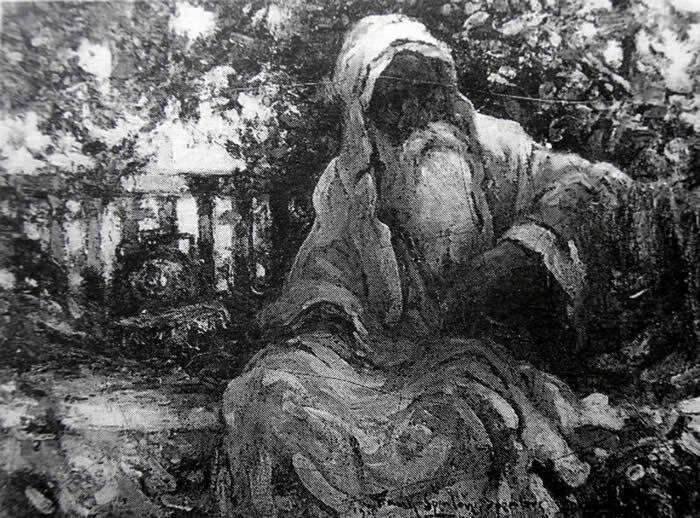 British (1865 - 1937) Landscape and Portrait painter born in Constantinople . 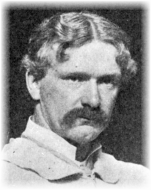 Member of the Royal Society of British Artists 1903. Born Manchester. Primarily a landscape painter in oils. Working in Cornwall. Exh; RA:16, SBA; from 1899 onwards (170); GL3, L1, NEA 1, RBA 133,SWA, 96. Eleanor (Weymouth) HUGHES RI (1882 – 1959) Born in Christchurch, New Zealand. 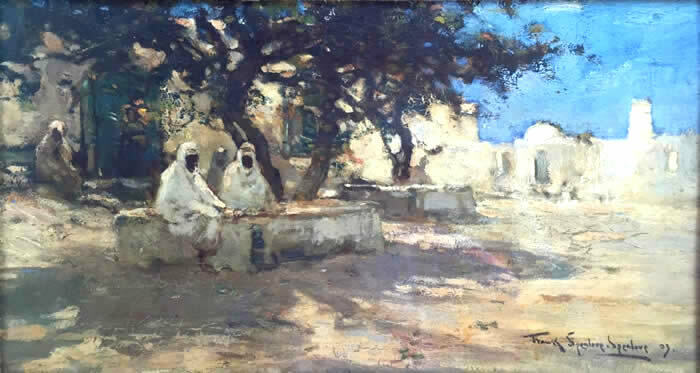 Trained under Stanhope Forbes. Became a leading member of St Ives School in Cornwall. 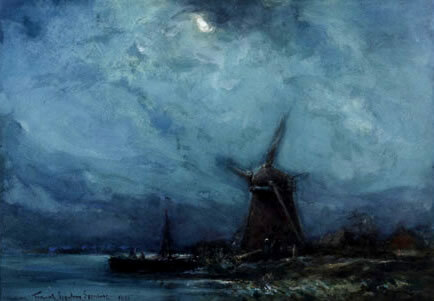 She exhibited at the RA 37 times (all pre 1939) and the Royal Institute of Painters in Water Colours 34 times. 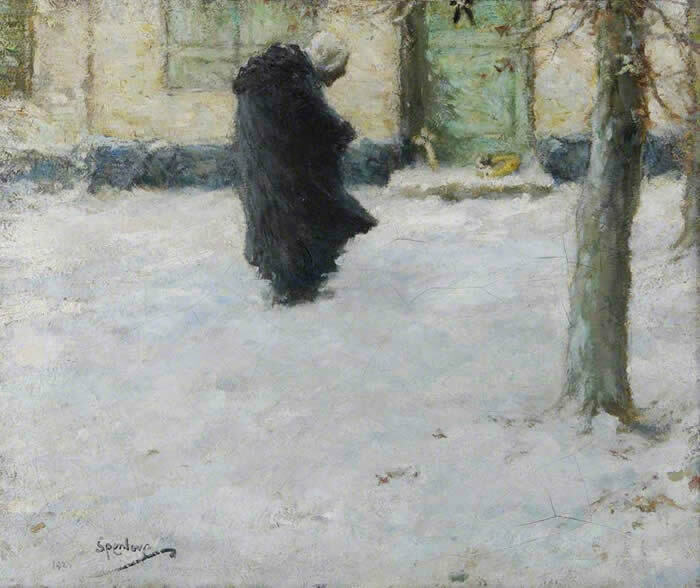 She also exhibited a the New English Art Club (7), Glasgow Institute (9), the Society of Women Artists, the Walker Art Gallery, Liverpool, and elsewhere. 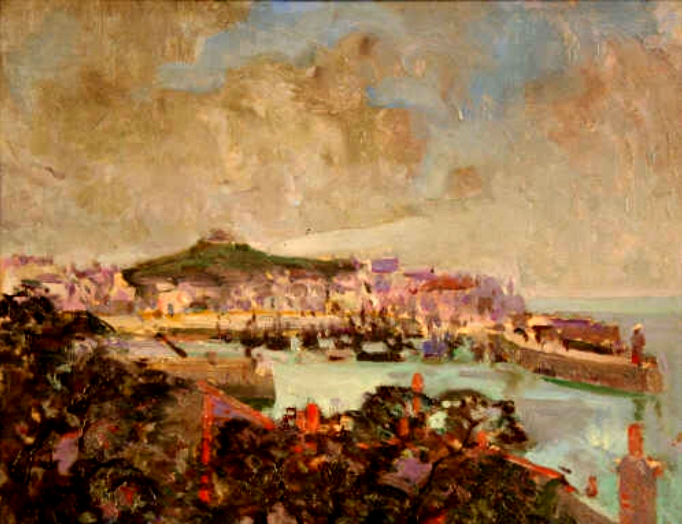 She exhibited with the St Ives Society of Artists 1933-late 1940s and took an active part in the organisation. 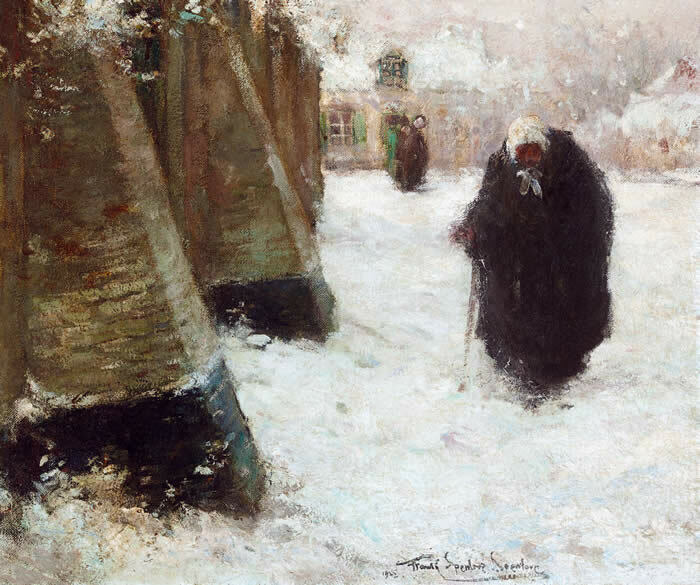 Her works are held in Public collections. Thomas Sherwood LaFontaine (1915-2007) Born in Turkey to English parents. 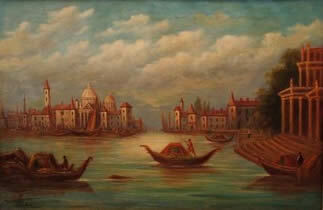 Special interest in animal paintings in oils and watercolours Horses, dogs, sporting. Often mistaken for Munnings. Exh RA 8. Margaret THEYRE WIAC British ( 1897-1977 ) Born Northampton painted mainly landscapes, horses and figures but was also a potter. Worked extensively in the Pyrenees. 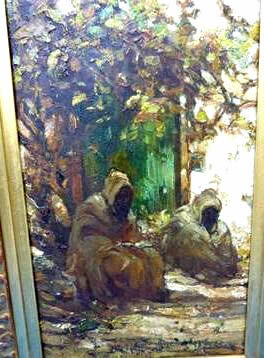 Exh;1921-40. RA 2, RBA 2, RCA 18, RHA 3, RI 3, D 1, Gl 1, L 3, LS 3, SWA 3, WG 18 and Cooling Galleries. 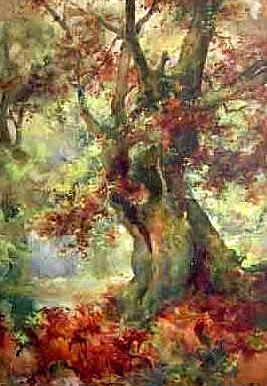 Theo (Theodora) MOORE (1879 - 1968 ) British watercolourist painting landscapes also in oils. Born in Birmingham. 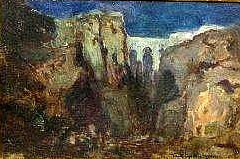 Exh: 1911-20) Exhibited at the RA, AB 2, RI 2, ROI 2, SWA 9. 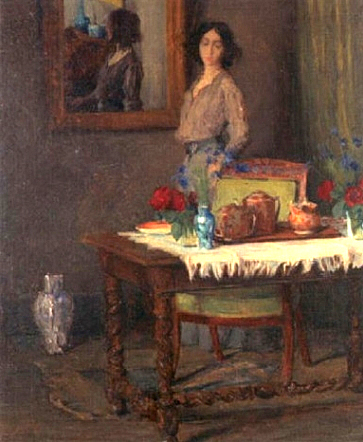 Paris Salon 1927 Abbey Gallery. 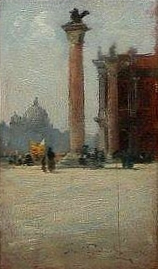 Exhibited at the RA, RSA, RP P 1, ROI 1, and abroad. Received an Honourable Mention at the Paris Salon 54, Silver medal 55, and a Gold medal in 1960. Phyllis HESELTINE ASWA (Fl 1920’s ) British Children’s portraitist in watercolour. Born in Essex. 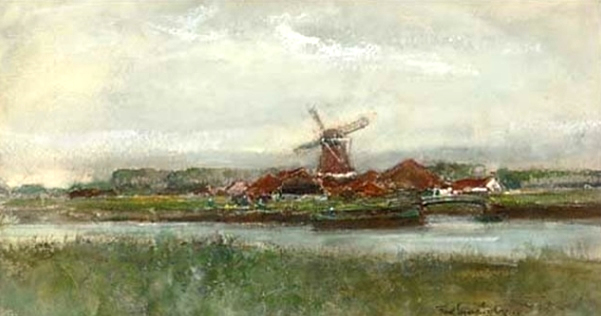 Charles Mayes WIGG (1889-1969) British landscape artist and etcher, particularly Norfolk and the Broads. 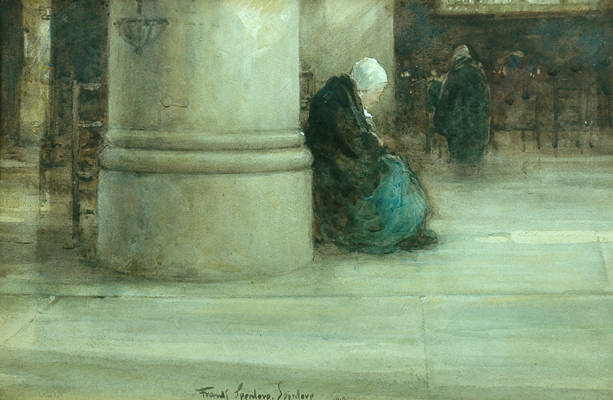 Exhibited at the RA in 1915, the British Watercolour Society and in Norwich and Yorkshire. Agnes Marion MIDDLETON ( fl 1915 -1950 ) British. 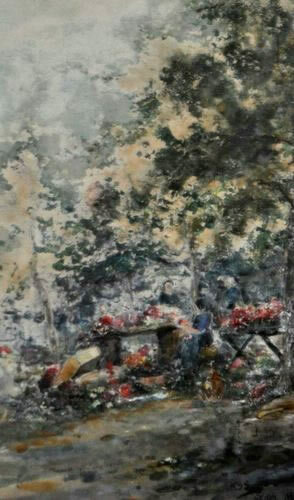 Norwich art circle artist painting mainly Landscapes and flower studies. Exhibited: RA 1, and Nottingham 6. Born Gateshead. Landscapes , Portraits and Flowers. Exh; 1919 Artists of the Northern Counties, (Laing) RA 1950, Glasgow Institute, Royal Hibernian Academy, Royal Scottish Academy, Society of Women Artists. Became Frank's studio assistant. 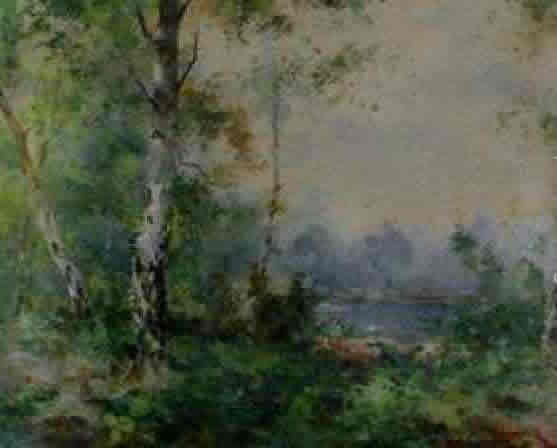 Edna W. GUY RSMA., (1898 - 1969) British; from Sutton in Surrey: Marine painter mainly in oils. 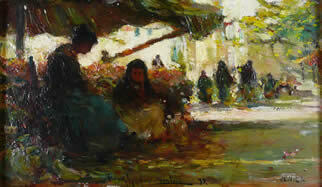 Exh: RA, RI, RSMA, RSA, NS, SMA, SWA, Paris Salon and widely abroad. Rosa Ellen TAPP ASWA ( 1864 –1940 ) from Beckenham:– Exh 1902-1918 34 works + some florals Elected an associate of the Society of Artist of Women Artist in 1905 and she exhibited at the Royal Society of Artists, Manchester City Art Gallery, Royal Cambrian Academy and the Society of Women Artists and the Royal Institute of Oil Painters. Herbert Francis PILGRIM (1915- ) British, born in Woolwich London. A landscape painter and photographer with a special interest in animal subjects. Exhibited in London. 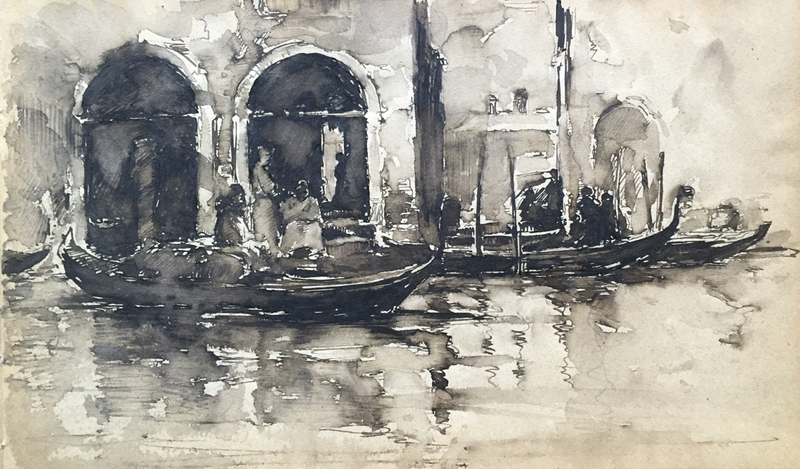 Watercolourist travelled in Europe, painting in many countries also travelled to Malta. Came to train and Exh; London 1911 and Paris. 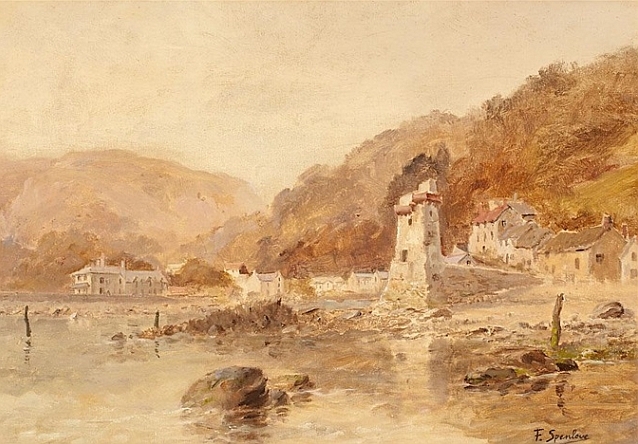 Exhibited RA, Royal Institute of Water Colours, Scottish Watercolour Society. Society of Arts NZ 1919. Auckland Society of Arts. Otago Art Society The oldest society in NZ. 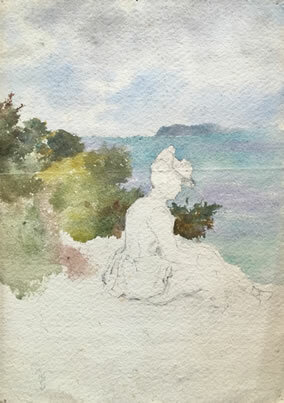 Six of Esther's watercolours are at the Aigantighe Art Gallery in Timaru. Represented in McDougall, DPAG, and Aigantighe Art Gallery, Timaru galleries NZ. 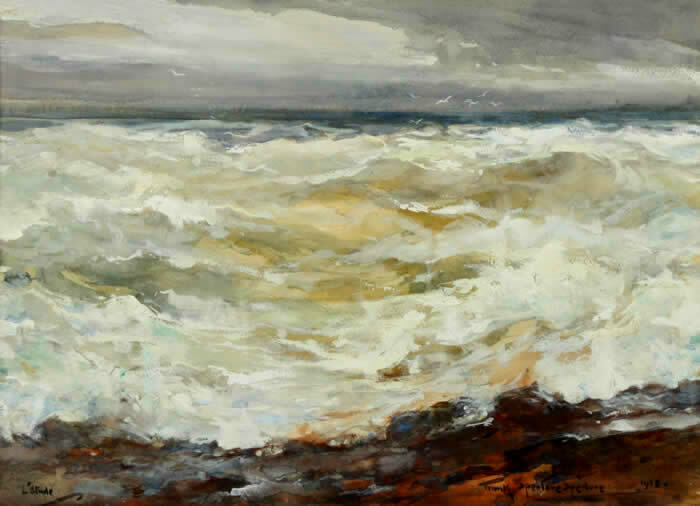 Exh; Edmonton Art Club, and throughout Britain most noticeably in the Royal Scottish Academy and the Royal Scottish Society of Painters in Water-colours in Edinburgh, and the Royal Glasgow Institute. Royal Watercolour Society, The Royal Institute of Painters in Water-colours, Britain in Water-colour and the Royal Society of Marine Artists. George RAFFAN ( Exh 1937-40) British landscape painter from Sussex. Exh; RA 1, NEA 4, P1, RBA 3, ROI 4. Cicely Brigit MARTIN. 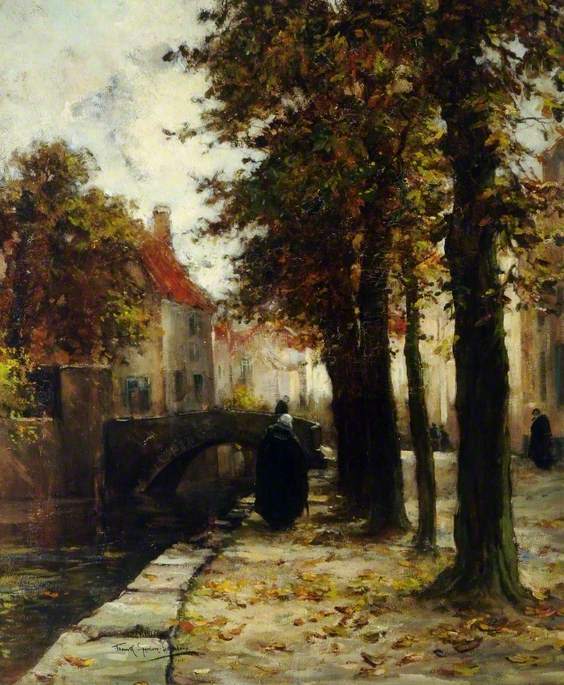 ASWA (1879-1947) born in Lambeth, London. 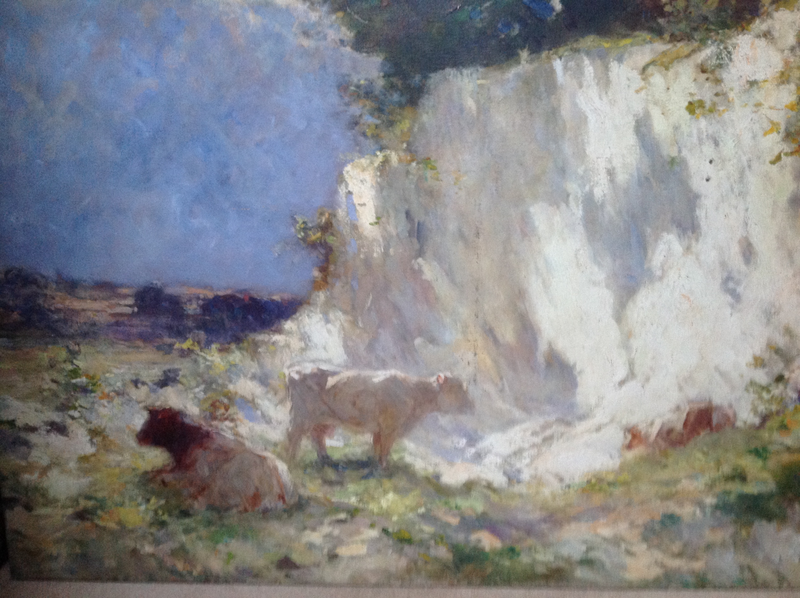 Exh 1899 – 1913 - 37 works; Painter in oil and watercolour of landscapes, figures and flowers. Marie Olivia Hewson GUEST (1880-1966) Canadian, born in Nova Scotia. 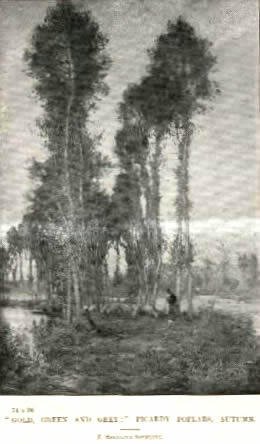 Studied under Spenlove 1913. 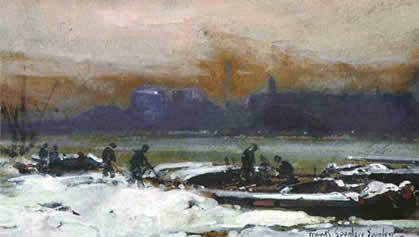 Became one of Winnipeg’s most notable artists in the 1940’s painting watercolours. 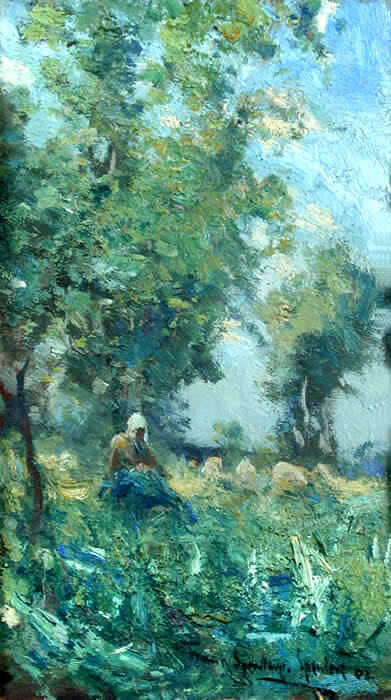 Exhibited with the Royal Canadian Academy (1928), Women's International Exhibition (1928) and subsequently with the Ontario Society of Artists; Manitoba Society of Artists; Western Circuit; Two small-group shows in Winnipeg, Man. ; Florida State Fair, U.S.A. at Tampa in 1952. 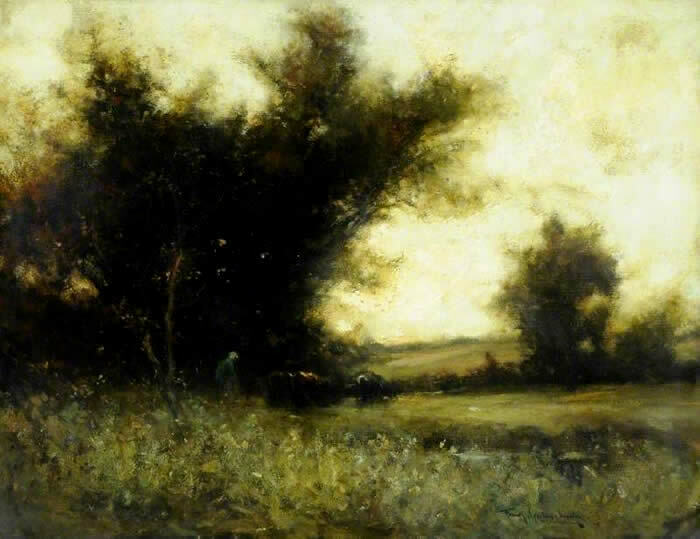 Henry Wellington WACK P. BsoA 1873 - 1955) (American) Born in Baltimore, Maryland. 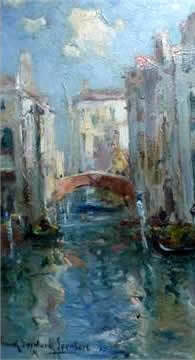 Landscape, coastal and marine subject painter in oils and watercolours, born in Cardiff. Exhibited BWS and provincially. 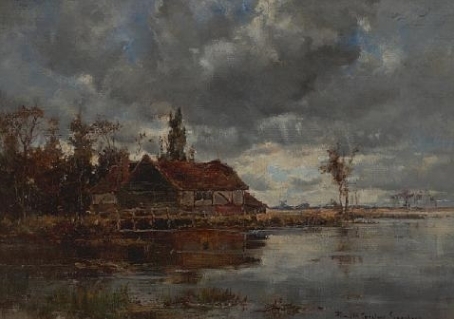 Also exhibited extensively with the United Society of Artists. Exh: NEA 1, P 3, RBA 1, RCA 4, RHA 1, ROI 4, RSA 5, SWA1. 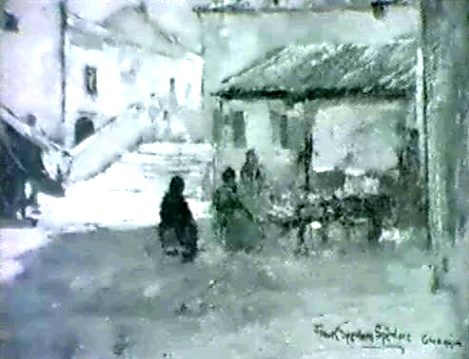 Painter of watercolours, landscapes, animals and f scenes. 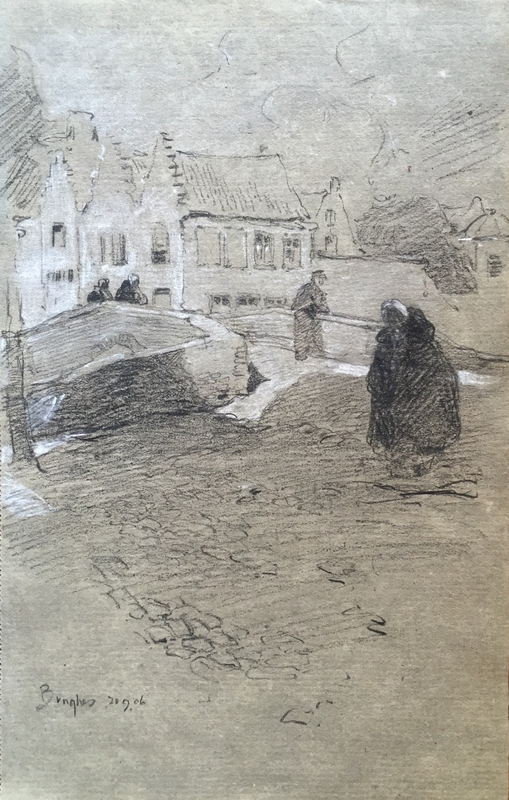 Travelled with Esther Studholme BARKER (1885-1975) Esther S Hope to England in 1911. Exhibited with CSA 1919–26. 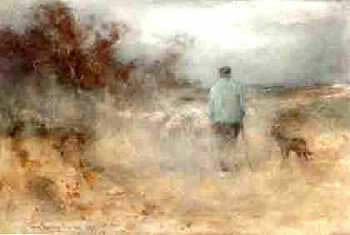 Painter of landscapes and horses. Bessie COOPER (Australian) miniature painter, landscapes and portraitist. 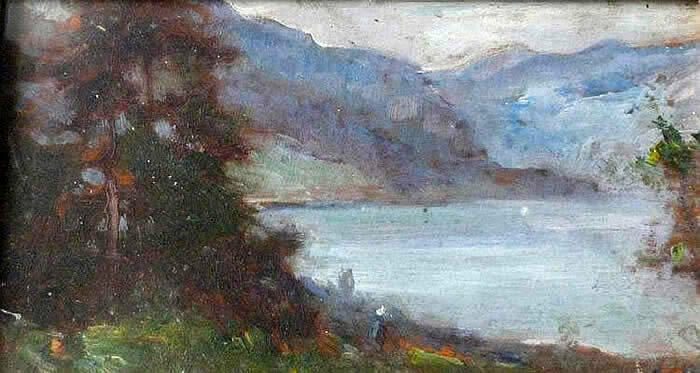 Olive Dutton GREEN ( 1878 - July 1930 ) Australian landscape artist working in oils and watercolours. Worked extensively in Brittany. Exhibited in Adelaide, London & Paris. 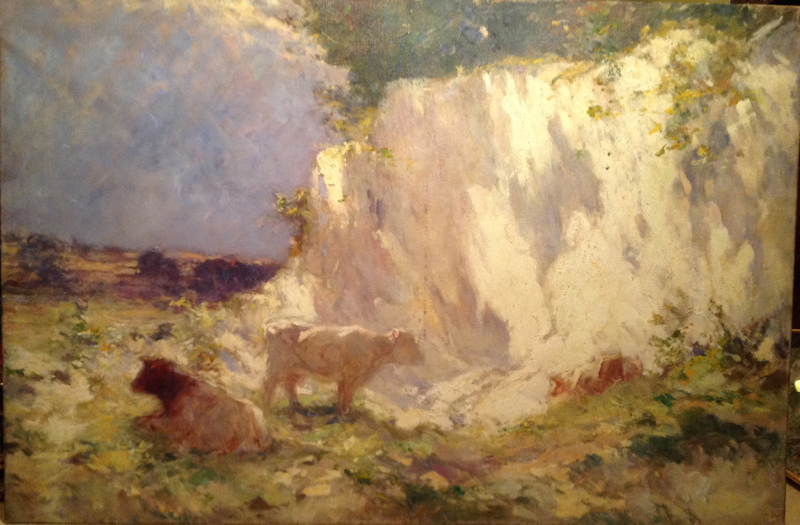 1920-24 Member of the South Australian Society of Arts; Society of Women Artists 3; Royal Institute of Oil Painters. Born Farringdon England. Emigrated to Canada. Landscapes in oil, watercolour and pastel. Also a printmaker. Founder member of Federation of Canadian Artists. Life member Edmonton Art Club, BC Society of Fine Arts,. 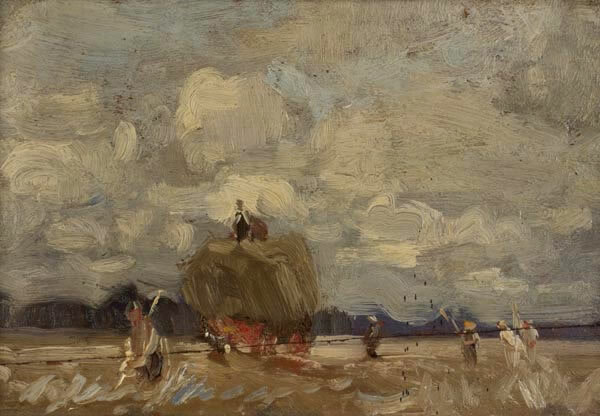 Exh: BC Society of Fine Arts, 1927-67 and Royal Canadian Academy 1927-33. Solo Exhibition in Jasper 1922 and Vancouver in 1933. Painted primarily landscapes ( Scotland) in oil and watercolour, but also became an accomplished stained glass designer. Exh; B1, D3, L4, RCA 16, RI. 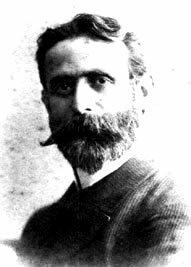 Elected member of the New Society of Artists in 1925. 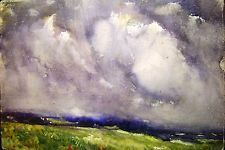 Liverpool Artist - Painting Florals / Flower Paintings - Landscapes in watercolours. 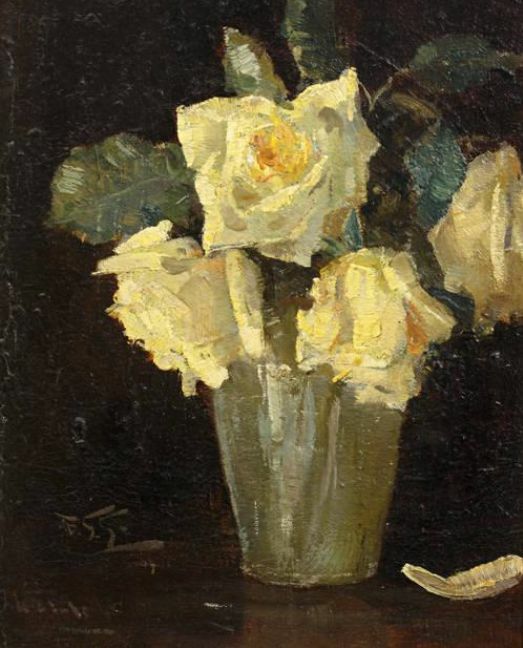 Marjory Graham ARNOLD (1884 – 1940 ) Australian. Painter and printmaker. 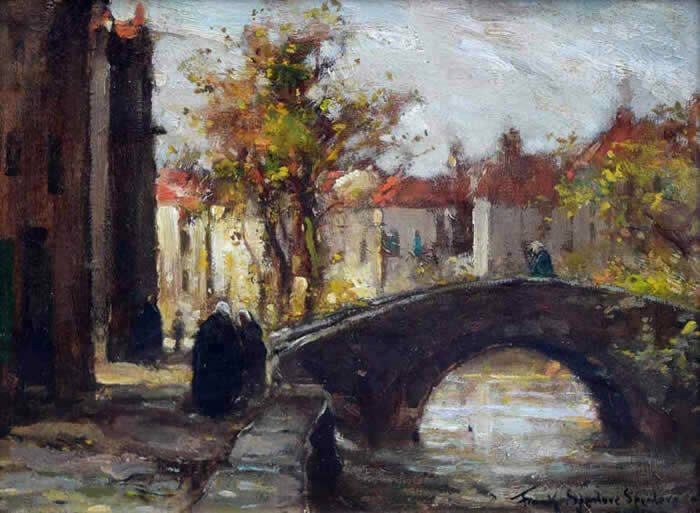 An active member of the arts community, she was a founding member of the Society of Women Painters and Exhibition Committee and the vice-president of the Women's Industrial Art Society in 1937. 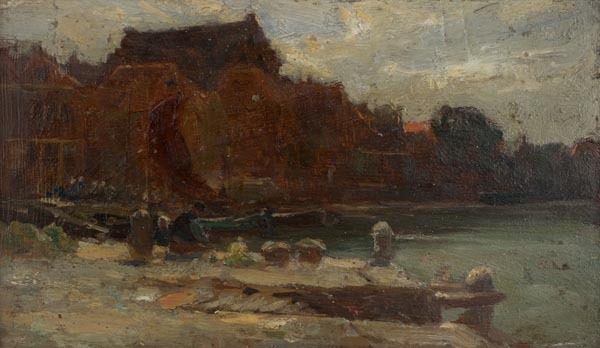 Associate of the Royal Art Society, Sydney Society of Women Painters, Women’s Industrial Art Society, Queensland Arts Society, Society of Arts and crafts, New South Wales. She Went on to write a book on oil painting under the pseudonym; Furze Walsh. "How to paint in oil." A suicide pact saw her and her husband Alexander, take their own lives, bound together at the waist. They were found in the Thames above Teddington. Well Frank was a logical man and the fact that first Yellow Door Art School in Beckenham had a bright yellow entrance door on the front, the name just stuck. But it has also been called over the years; The Spenlove School. The Spenlove School of Modern Art, the Yellow Door School of Painting, Spenlove's Academy, the Spenlove School of Modern Landscape Art. Yellow Door Studio, the Spenlove Art Academy, the Yellow Door School of Painting and the Yellow Door School of Modern Landscape and Pictorial Art ! 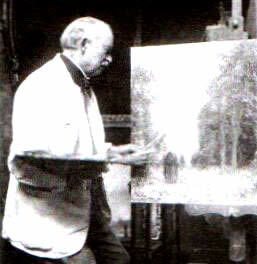 Frank Spenlove in the studio. "Students who are already finished artists, but who, feeling they have still more to learn - as the true artist always must return from time to time to the studio to put in some more hard work. 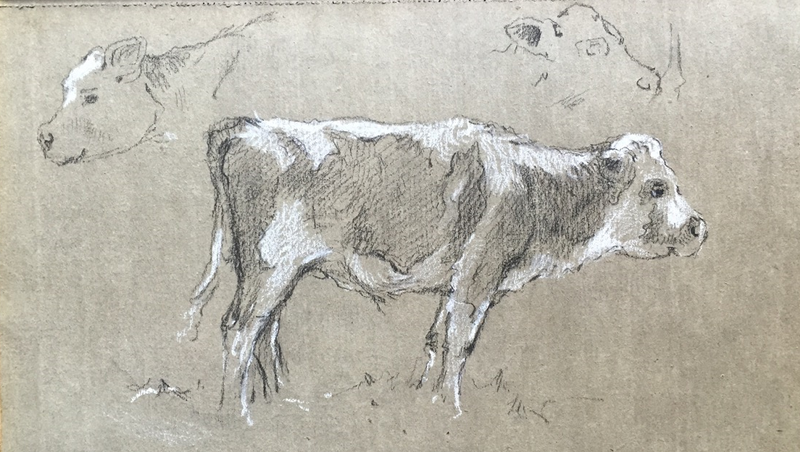 They will probably produce numerous drawings, paintings, and sketches, and will bring them to receive Mr Spenlove-Spenlove's criticism and advice towards the latter part of the lesson, when the class has been well started and he has at last found a few free moments to spare. One of these, was a beautiful study, full of poetry and imagination, showed a pool with nymphs bathing by the light of the moon, with a wonderful effect of the light shining through trees into the glimpse of dark water. Mr. Spenlove-Spenlove finds that this plan of having students at all stages of progress working together in a single class-room, is very helpful to beginners, for the advanced ones form a ladder leading them on and encouraging them to further efforts towards success. Many of the students, who are anxious to be able to introduce figures into their landscapes, work from draped figures and costumed models posed in the studio on one or two days a week. These models are chosen with a special view to their subsequent introduction into the students' landscape pictures. Dressed as Elves, fairies, milkmaids, herdsmen, woodcutters, and harvesters, they all visit the studio in turn." The Spenlove Art School - Tuition Fees etc. "The school year is divided into three terms, or sessions, of twelve weeks each. The 'Spring lessons' beginning on the second Monday in January, the 'Summer session' on the third Monday in April, and the 'Autumn session' on the fourth Monday in September. Classes for general painting and drawing, both elementary and advanced, are held on three mornings a week from 10 till 1 o'clock, for which the fees are four guineas a session. Pupils drawing or painting from the living model, either draped or in costume, pay half-a-guinea extra for the term. Per session of twelve weeks or twenty-four lessons, two mornings or two afternoons a week, £11.11s. For a course of twelve lessons, two mornings or two afternoons a week, £6. 6s. For a half course of six lessons, one afternoon a week, £3. 13s. 6d. 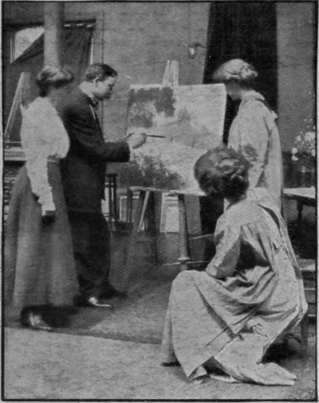 The fees for special private demonstration lessons at the studio on " The Art of Picture Making," lasting for about an hour, are £11 for a course of twelve lessons, and £6. 6s. for a half course of six lessons, while the fee for a single private demonstration lesson is £2. 2s. 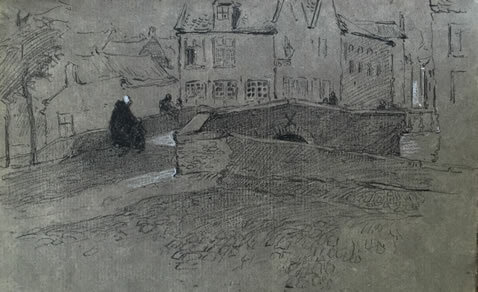 The Corner House, 69, Addison Road, Kensington"
The Outdoor Sketching Lessons in Eynesford. "Mr.Spenlove-Spenlove also holds a series of special outdoor art classes two days a week, during May, June and July. These are in the Darent Valley which is in the village of Eynsford, Kent, which, though only a few stations beyond Beckenham and but a half-hour journey from town, is one of the most picturesque spots imaginable. It boasts, besides a charmingly picturesque stone bridge, a stream with overhanging willows, meadows and orchards, haystacks and picturesque barns galore, and a row of real old Queen Anne cottages. 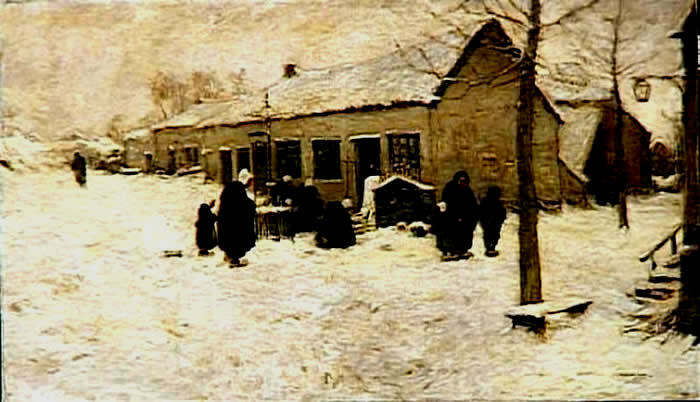 A picturesque cottage at the further end of the village, right out in the country, provides a pleasant rest house for students, and here simple meals can be obtained and easels and painting outfits stored. It is a very handy place of refuge in showery weather." 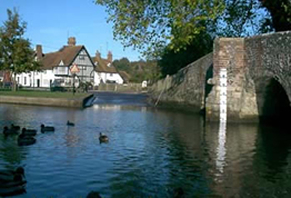 "The members of the Yellow Door sketching class meet at Victoria station soon after 11 o'clock, and on arrival at Eynsford, scatter throughout the village to spend the whole day studying out in the open. Each student picks out her own subject for a sketch, and sits down to paint it, while Mr. Spenlove-Spenlove strolls briskly from pupil to pupil to give each one a brief but most pertinent and illuminating lesson on the piece of work in hand before passing on to the next. 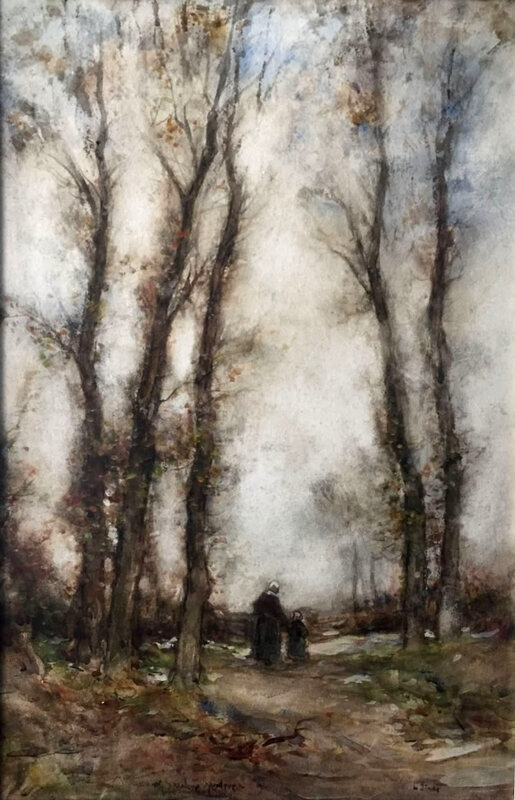 The members of the class often range from finished artists, who are already successful exhibitors at the various picture shows of note, to young girls who are making their first tentative steps in the direction of landscape painting or sketching. Mr. Spenlove-Spenlove's keen interest and helpful enthusiasm over their work is the same for all, and the way in which he gives students confidence in their own powers and brings them on in their work is astonishing. Good lodgings are obtainable at Eynsford, and Mr. Spenlove-Spenlove's students often spend a month or two down there during the summer months, joining the outdoor classes two days a week, and working by themselves between whiles. The fees for the outdoor classes are £6. 6s. for twelve meetings, and £3.3. 6d. for six, and as the number of pupils joining each class is strictly limited, each one gets much individual attention." A.C.R. 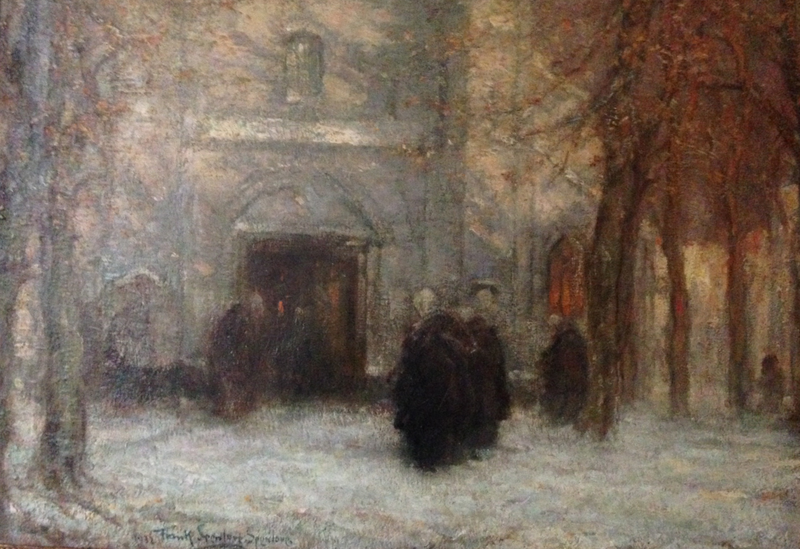 Carter, in the 'Art Journal of June 1910, was not the first to note the influence on the young Frank Spenlove, exhibiting his 'Watchers' at the Royal Academy for the very first time. 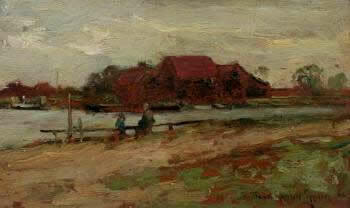 He mentioned obvious similarities to the Dutch artist Isaac Israels. 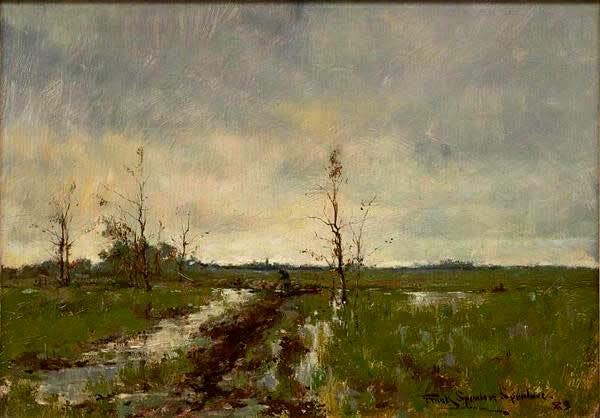 (Amsterdam 1865-1934 Den Hague) An artist that was Clearly an influence which continued throughout Frank's artistic life and as his fluidity and captivating atmospheric and dramatic style emerged. 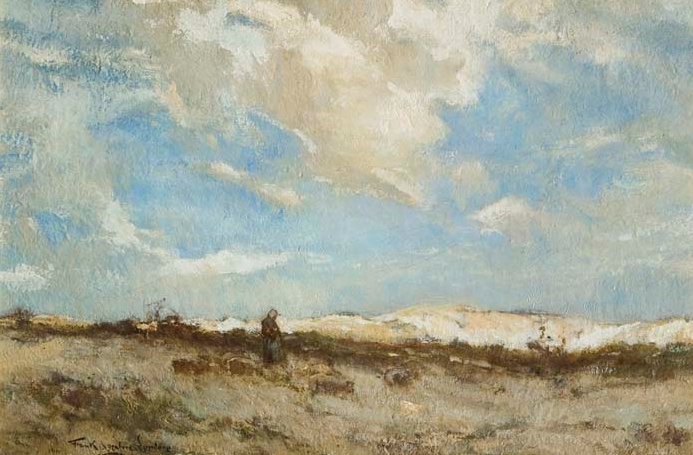 Frank would also be the first to tip his hat to the artistic ability of the great J. M. W. Turner, who he admired enormously and whose methods he applied and adopted personally. 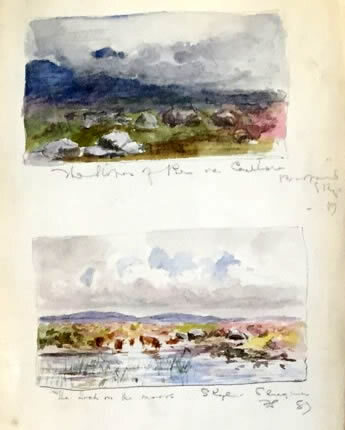 "Turner, again, always worked from the slightest of sketches and rough notes, and Mr. Spenlove-Spenlove thinks this undoubtedly the right method of procedure, and accordingly, in teaching landscape painting, his system is to encourage his pupils to make swift realistic studies from Nature out of doors, seizing some transitory exquisite effect, and afterwards to study the art of transforming these rough notes of a passing effect of the moment into a finished picture in the studio, both by means of individual instruction, which each one receives, on the working up of his or her own particular small sketch, and by means of his special landscape painting "demonstrations" before the assembled class." The American artist Edward Biberman (1904-86) in an interview back in 1977, recollects his meeting with Frank Spenlove Spenlove whilst he was in Cornwall holidaying. He had just painted a portrait of his daughter, which is sadly now lost. "The English artist had a name which was fantastic. His name was Sir Frank Spenlove-Spenlove R.A.
Frank Spenlov looked like a Peter Arno cartoon. He was very big, florid, [with a] great white moustache. And a charming man. The painting of his daughter, incidentally — I don't know where it is, or what happened to it. Somewhere in my moving, that painting has been lost. It just disappeared and I have no sense of what happened to it?" A member of the Committee of the British art section - Liege International Exposition of 1906, where he was awarded the Diploma of Honour. And a member of the City of London Truss Society for the relief of the ruptured poor ! We are told that recreationally Frank really loved billiards and regularly held evening sessions at his central London home. He also enjoyed golf and music too and was a very 'charitable' man. In so doing, Frank lent his name to newspaper advertising around the world. Appearing as here in Pall Mall Magazine and regularly in the Commonwealth press. 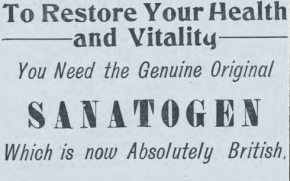 B.I., F.R.G.S., says; "after trying different so-called remedies I was advised to try Sanatogen. It has worked wonders " in fact, quite overthrown the trouble." Not arranged in chronological order. 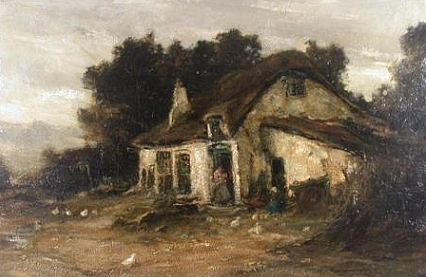 Awarded Gold Medal and purchased by the French Government for the Musée du Luxemboug. 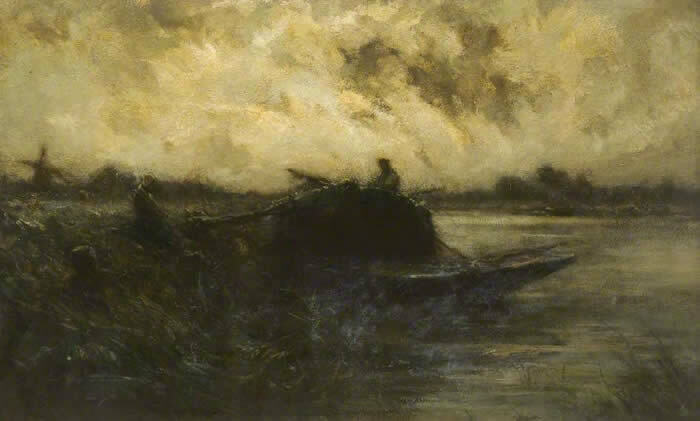 Frank Spenlove was nominated for Associate membership to the RA first in 1909. 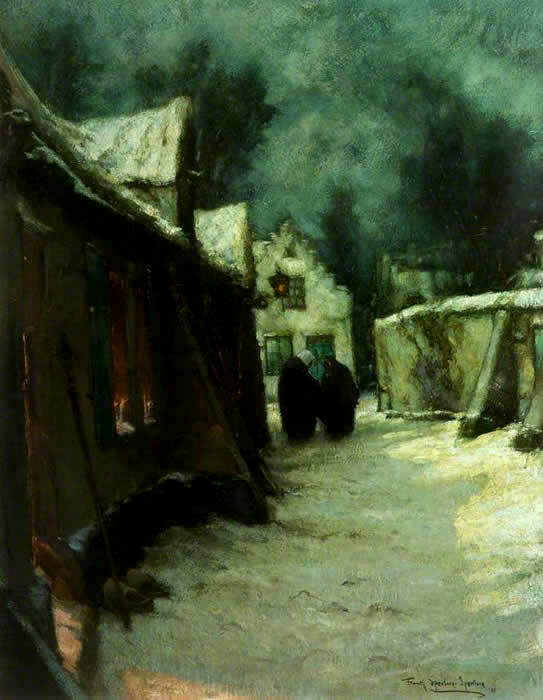 Backed by Frederick Pomeroy, Derwent Wood, Charles Napier Hemy, Arthur Hacker, Andrew Gow, Luke Fildes and William Frederick Yeames. On the second occasion in 1920, his nomination was supported by artists Frank Dicksee, Frank Short, Henry Scott Tuke, Reginald Blomfield and David Murray. Sadly, that nomination did not carry sufficient support for Frank to be considered for inclusion. 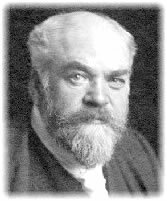 The then President of the RA was an architect called Sir Aston Webb. That year saw two architects elected as Royal Academicians; Francis Derwent Wood, an architectural sculptor and Edwin Lutyens. For the RA nominee, once he has achieved securing Academicians as supporters, the wait begins and politics takes over. It ends with a meeting of all the Royal Academicians casting their votes in camera for the proposed candidates. “Let it be given to the more worthy”. For Frank, the Academy, by his exclusion, had driven home the worst kind of insult and the row which followed with Aston Webb must have sent ominous rumbles through the building if not the Academy itself. Clearly Spenlove would have felt rightfully embittered and disappointed. Frank would never again exhibit at the RA. What he previously had exhibited at the Royal Academy over the preceding 33 years was and is a genuine testimony to his genius as an artist. In time we hope with this project, to be able to secure imagery for all the titles Frank Spenlove Spenlove created. This list grows daily and with your help, will continue to do so: However many were lost in the Blitz and many more have vanished into the mists of time. Alt: Le dernier voyage - interremont du une pilote. Exh. 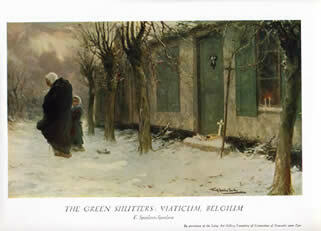 RA 1903 72 x 48"
“Too Late “ was taken to Pittsburgh by the evangelist, the Rev. 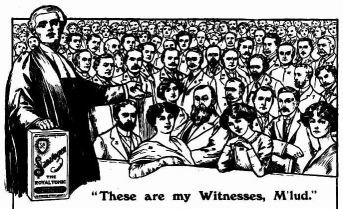 W R Wedderspoon as the subject of his famous sermon preached to over 10,000 people August 23rd at the Great Auditorium of Ocean Grove, New Jersey in 1909. 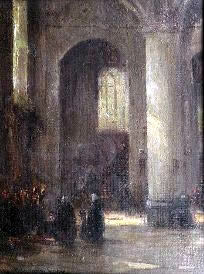 #229 Royal Academy of Arts exhibition 1910. 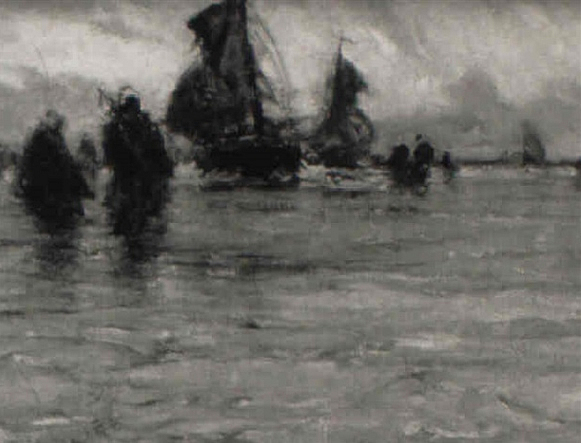 A second painting of the same subject with several figures existed. Franks own records and images confirm same. This image is to follow. 1899~ Gold, green and grey. by Frank Spenlove at the Royal Academy Summer Exhibitions over 33 years. There were two successive paintings with this title. 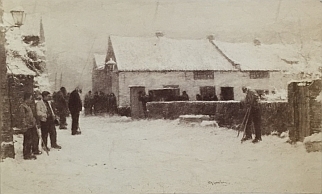 The first torn in the studio and repainted by the artist. See Biography. Described by the London Daily News London, England 7 Jul. 1891 as "very agreeable in its greens and greys; and a bright and cleverly composed little bit of seaside idyll." 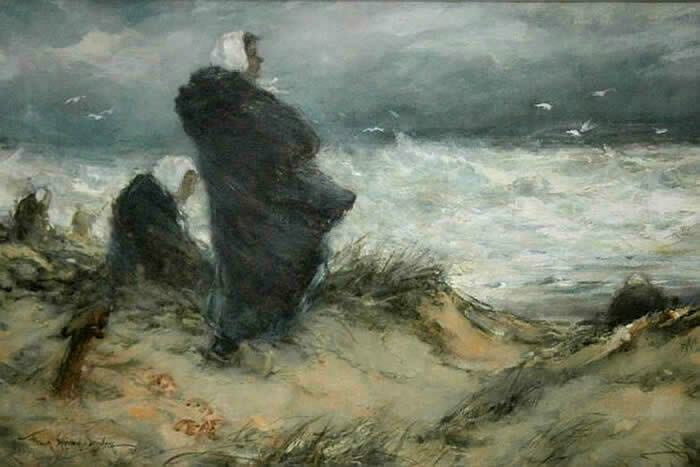 1910~ THE WATCHERS : " TILL THE DAY BREAK"
On the coast of Flanders. 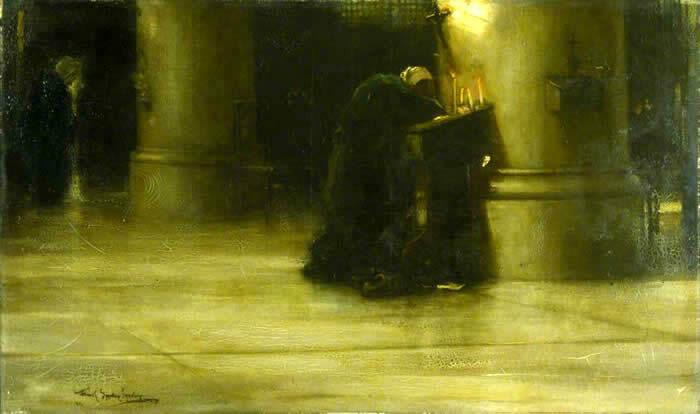 The Little Prayer ( Salon) ? 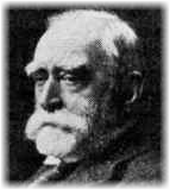 Frank Spenlove-Spenlove. 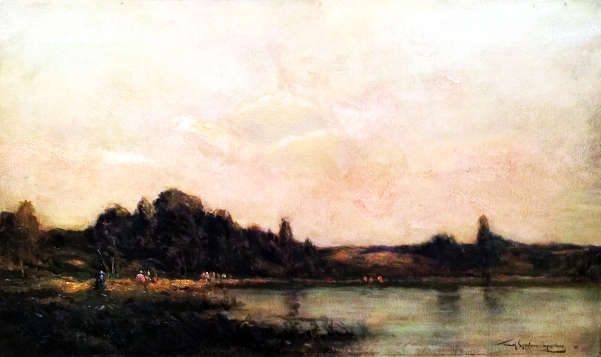 Painted: 1907 Exh RA. 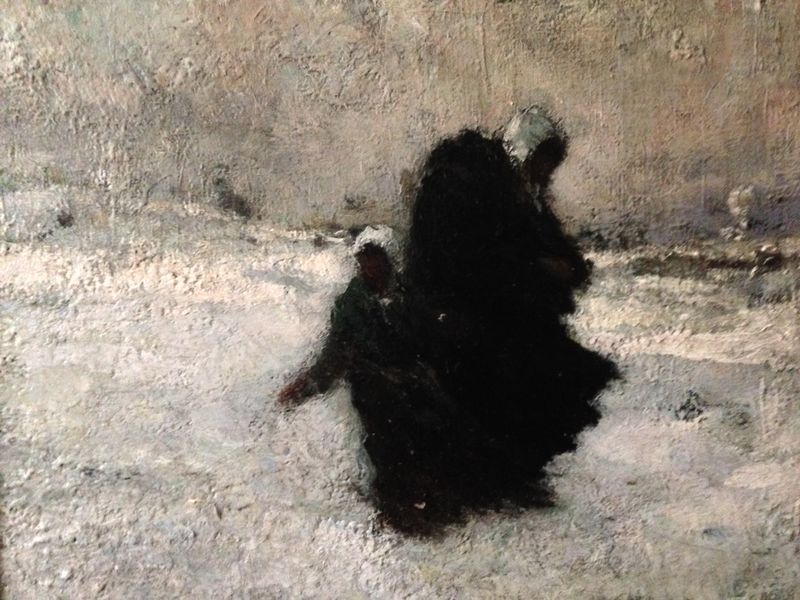 "The world forgetting, by the world forgot"
Woman and child in the snow. 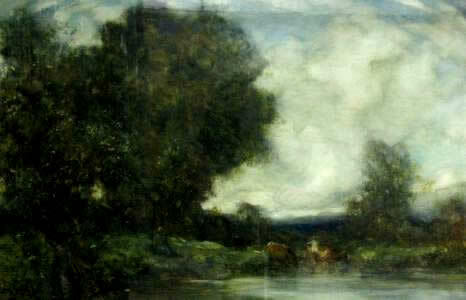 Oil on Reeves and Son Canvas 20 x 23"
(British, 1868-1933) signed lower right "Frank Spenlove-Spenlove '02" oil on board. Provenance: From an Essex country house. Exhibited: The Calton Gallery, Edinburgh. Signed, oil on canvas, 24 x 34.5cm. ; 9.5 x 13.5in. 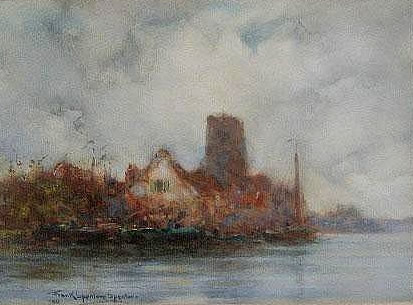 Watercolour heightened with white and bodycolour. 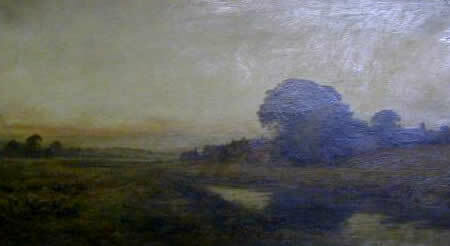 Signed and dated 04, oil on canvas, 25.5 x 46cm. 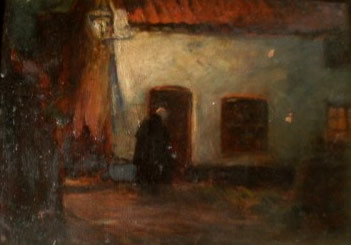 Oil on Canvas 35.6 x 50.9 14" x 20"
^The Light at the Door, a January Night in Flanders, 1907. Oil on canvas, 91 x 71 cm. to the Lagoon of Venice, Italy. 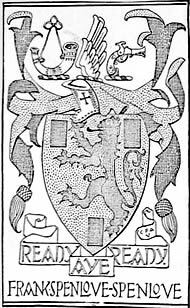 A book plate exists after Frank Spenlove-Spenlove. 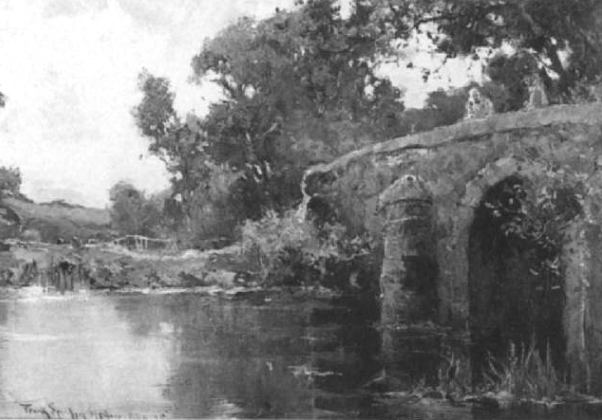 Retrieved from the 1904 edition of The Magazine Of Art. wall under the shade of an olive tree. Presumably based upon one of the above works in oil. ^ Grey day on the Sheldt. The evening after the rain. 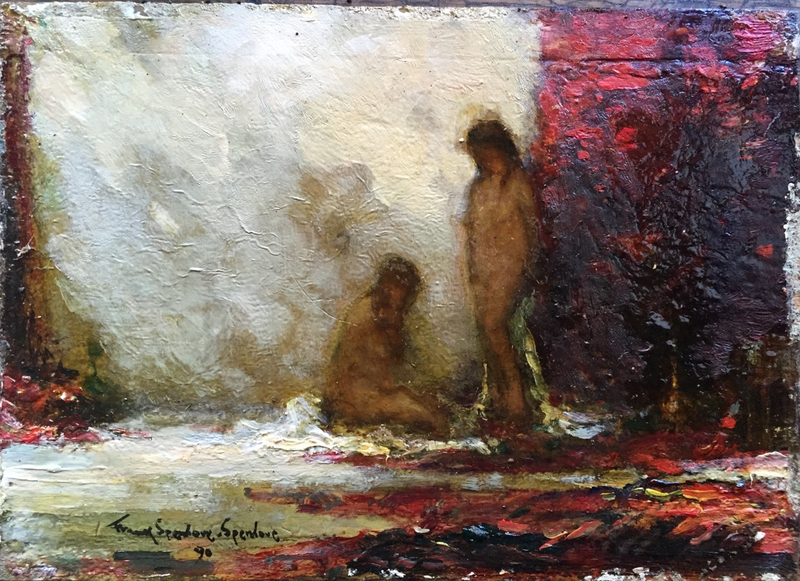 Signed lower left 14 1/2" x 10 1/4"
Oil on canvas. Signed and marked lower left. 59 1/2" x 39 1/2". 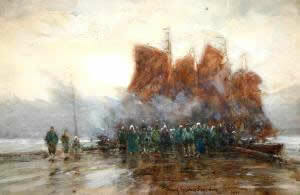 One of Frank Spenlove’s largest paintings. 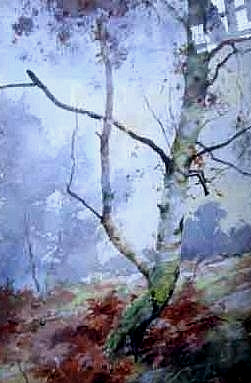 'Study of a Tree in Woodland', Watercolour. Mixed Media, Signed, 4.75" x 8.25". 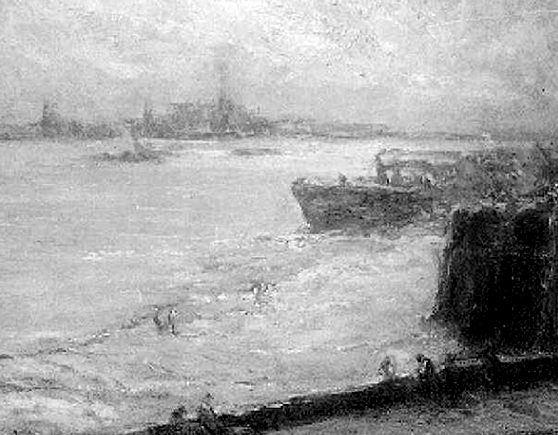 "Grey Day on the Scheldt Belgium"
S igned and dated 1922. 10" x 14"
A view of "Ronda, Spain"
A study of crashing waves with seagulls floating on the breeze. 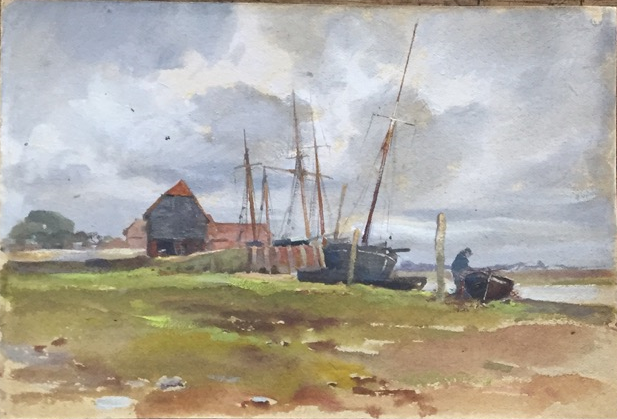 Signed and dated 1915, watercolour. With hand written label verso. 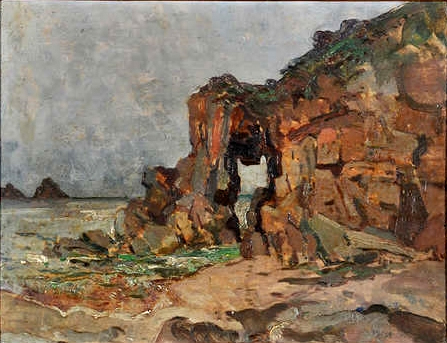 A rocky coastal scene signed oil on board 25 x 33.5cms; 10 x 13 1/4in. 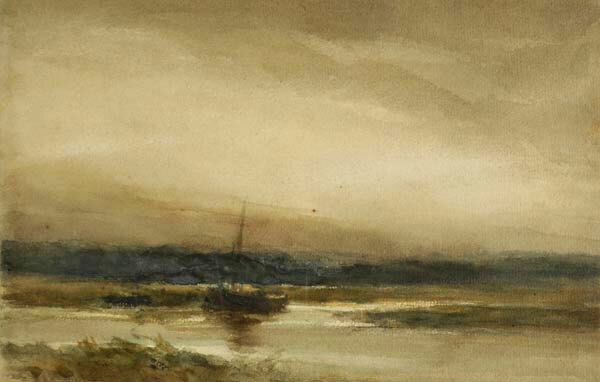 Boats moored in an estuary at dusk. 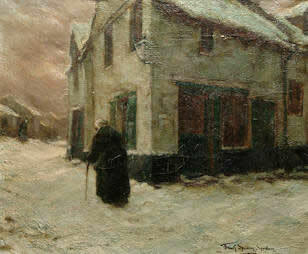 Oil on panel 15 x 22"
Though the work is signed and dated 1911? List of known Frank Spenlove works with no illustration yet discovered. Frank Spenlove-Spenlove that is not included in this catalogue. Spenlove, F. 51, Beckenham Lane, Shortlands. 404, 1033. 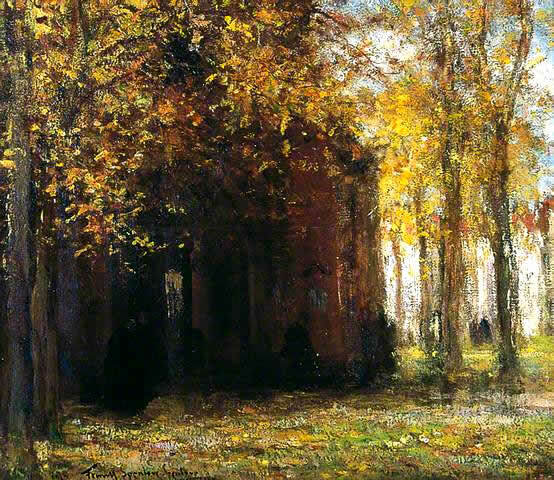 Orange building with large porch, figures in front, autumn trees around. Signed with initials at lr. Commissioned for the Library in Queen Mary’s Dolls’ House. 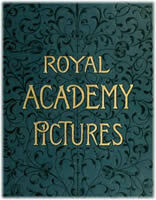 Exh: #91 Royal Academy of Arts exhibition 1910. 1915 - War Relief Exhibition in aid of the Red Cross and St. John Ambulance Society. 1918 - War and Peace Exhibition. For those in Peril. 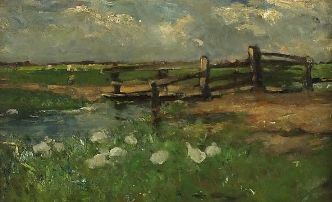 On the coast of Flanders. 27 x 43 cm watercolour heightened with white signed. "very agree- able in its greens and greys; and a bright and cleverly composed little bit of seaside idyll." 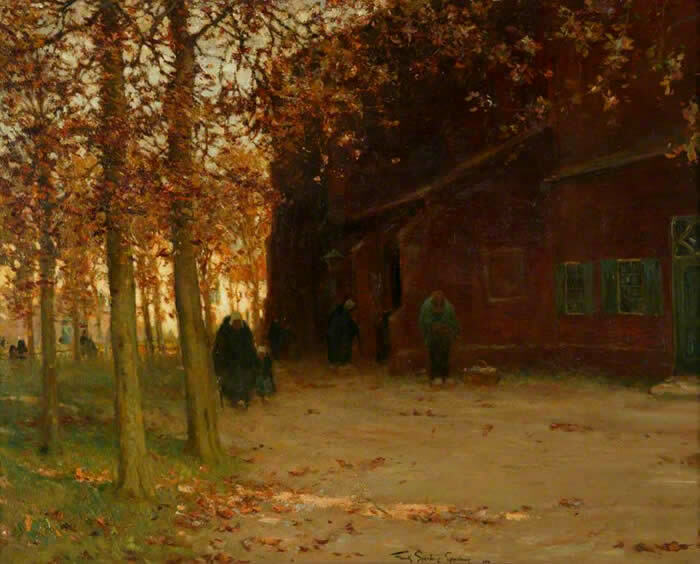 Chant of the golden hour 1897 ? 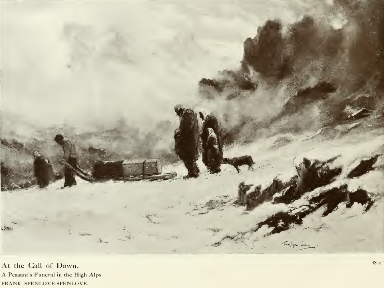 The morning post described it so: "The landscape is olive- black near at hand, and of a dark blue in the distance." 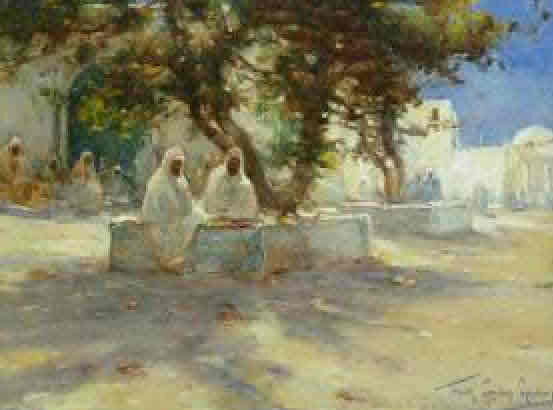 Gathering pilgrims paying homage and devotiions at a shrine. 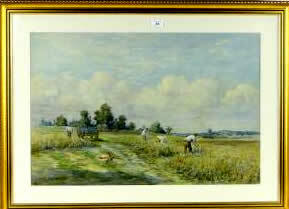 Has been bought at a handsome price by Mr. Read, a Glasgow art collector . L'Exposition internationale de Bruxelles. 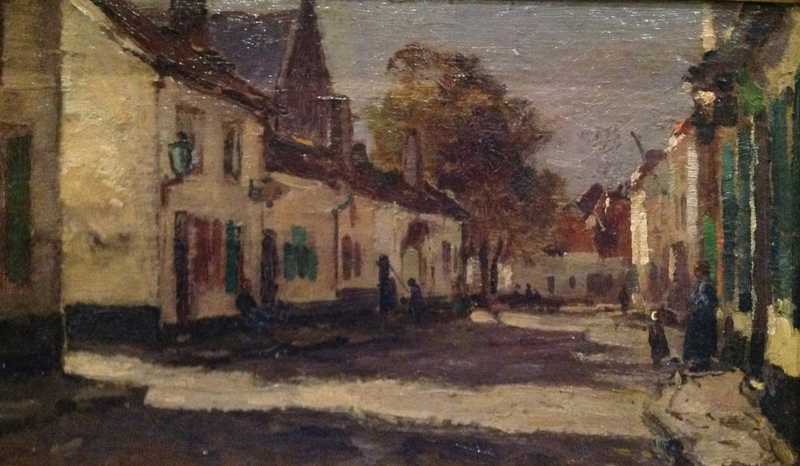 Beaux-arts 1897 # 142. Watercolour 6.75in x 9.75in. Signed. 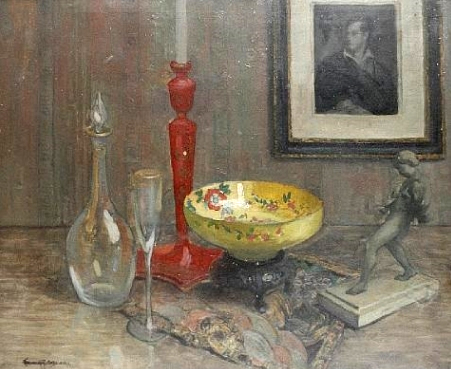 Still life with bowl of flowers. 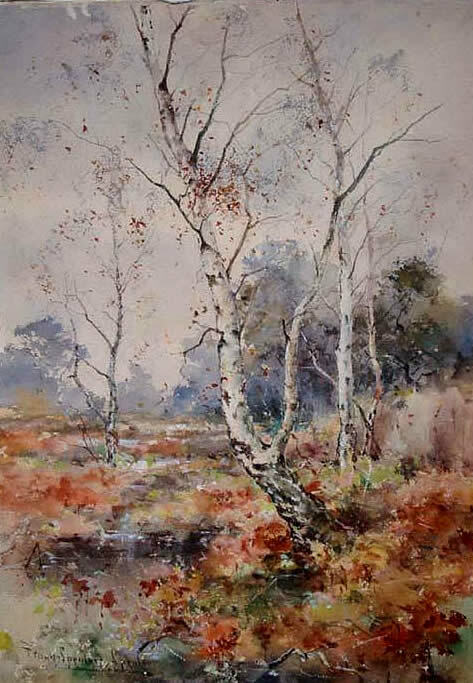 Heathland, Landscape with Birch Trees. 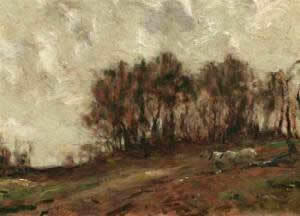 Oil/panel 9x5 inches (22x13 cm) signed & dated 18.9.-09. Bears Royal Institute label verso. 15.5in x 23.5in - 39 x 60cm.
" A fascinating scene in a Berkshire Lane"
Mentioned in (6. The art treasures of London. 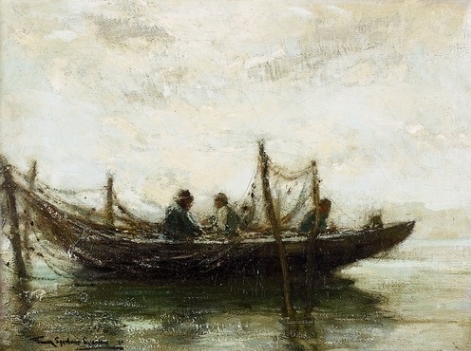 The work was acquired in 1921 as a gift from the artist. Paris Salon 1901 - 6 ~ Gold medal winner- Medaille de troisiemme classe. 91 ROI. 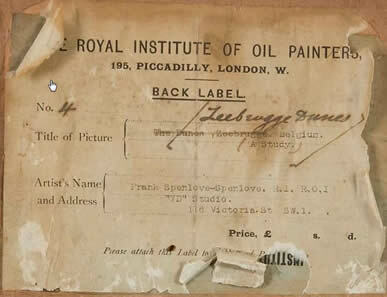 Royal Institute of Oil Painters. 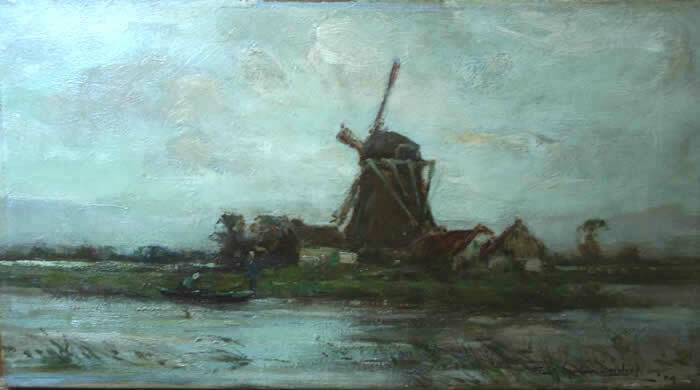 The only major art society which featured work done in oil. 42 RCA, Royal Cambrian Society. 38 Walker Art Gallery Liverpool. 21 Glasgow Institute of Fine Arts. 18 Manchester City Art Gallery. 18 New Gallery London between 1888 –1910. 9 Royal Society of Artists, Birmingham. 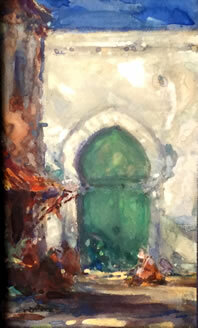 8 at the NWCS: The New Society of Painters in Miniature and Watercolours. 5 RHA Royal Hibernian Academy. Studio (See Indexes Volumes 27, 29, 41, 43, 63, 66. Connoisseur 42 (1915) 59f, 91. 1933, 409.